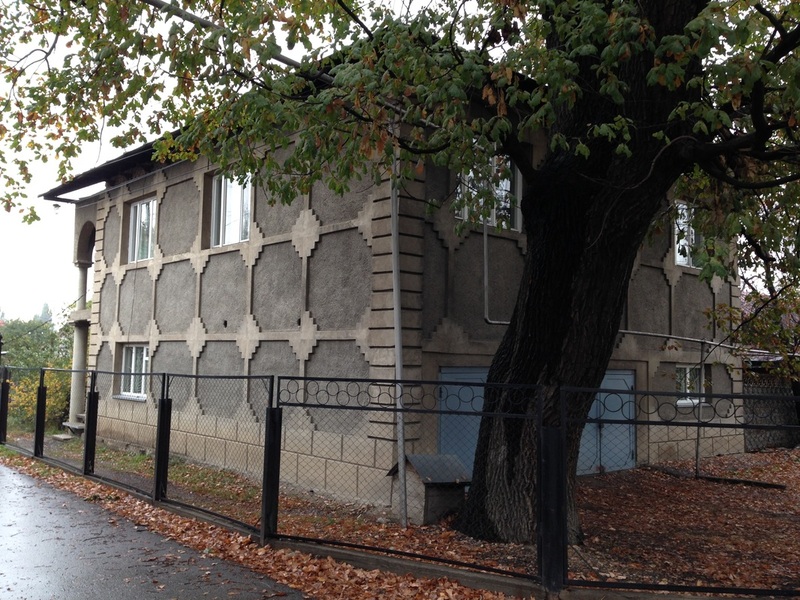 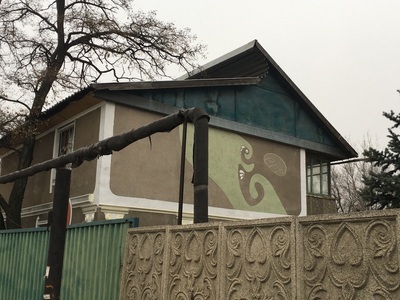 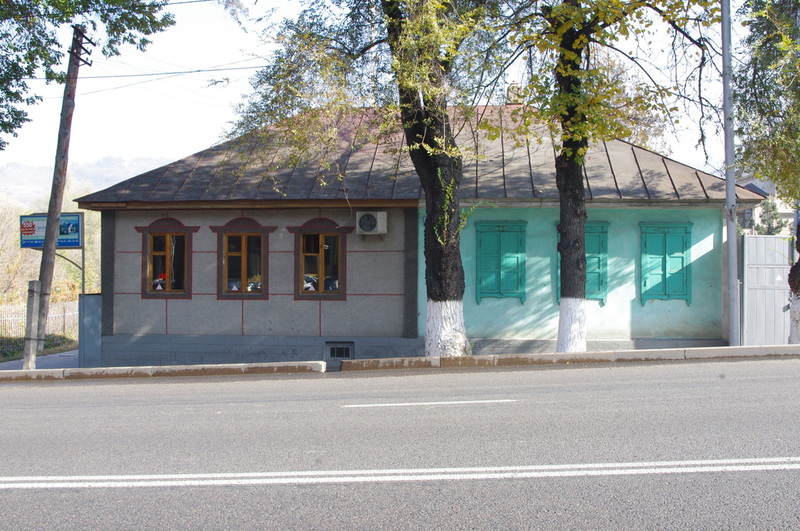 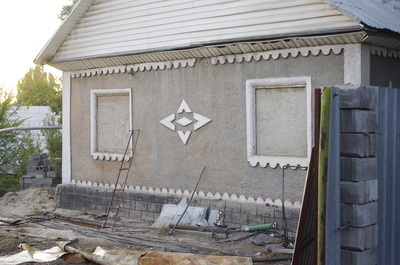 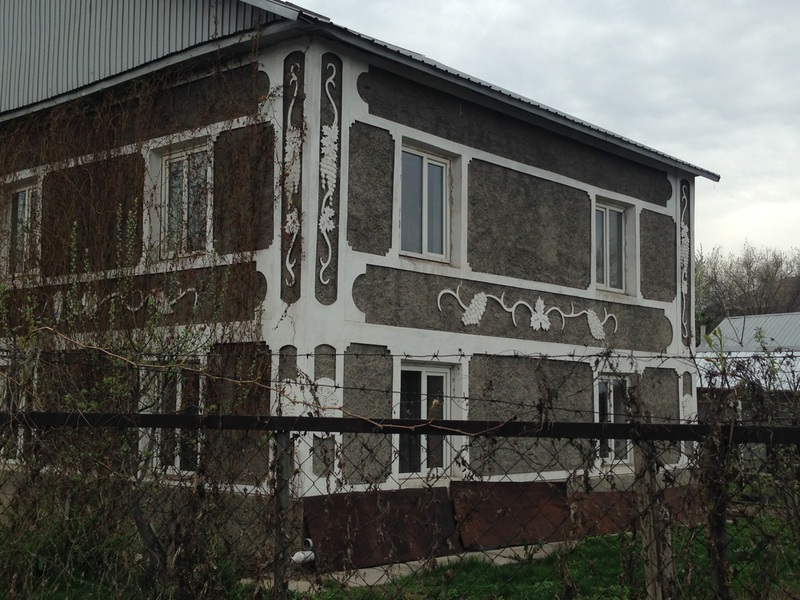 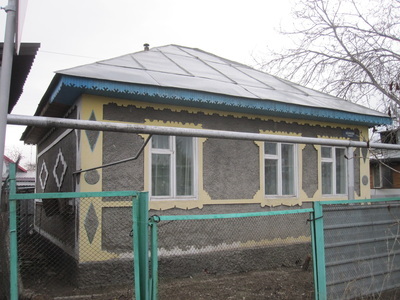 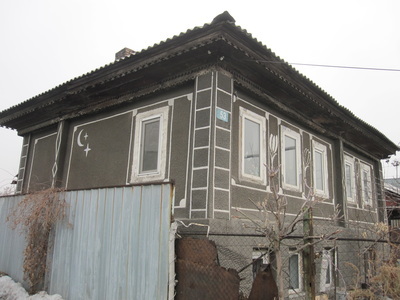 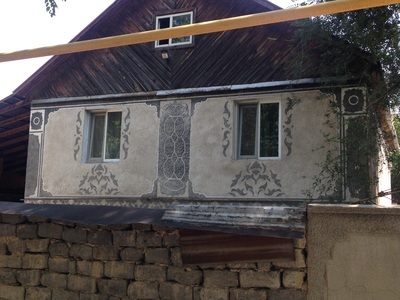 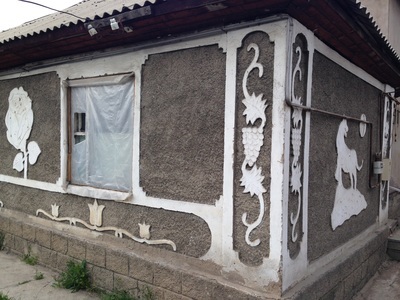 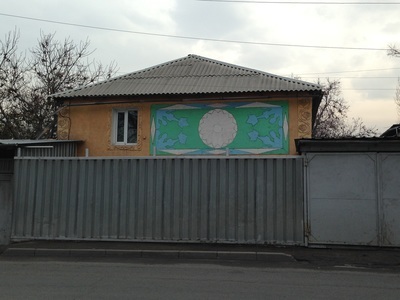 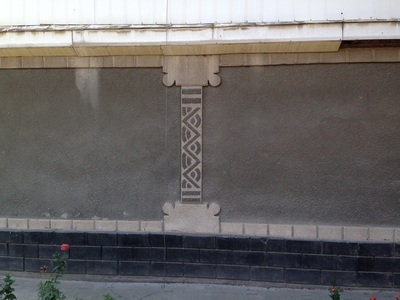 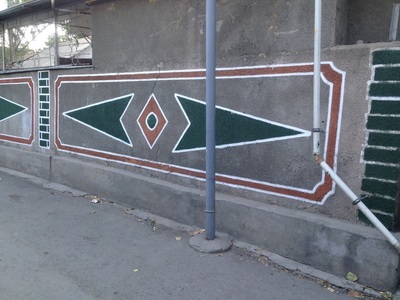 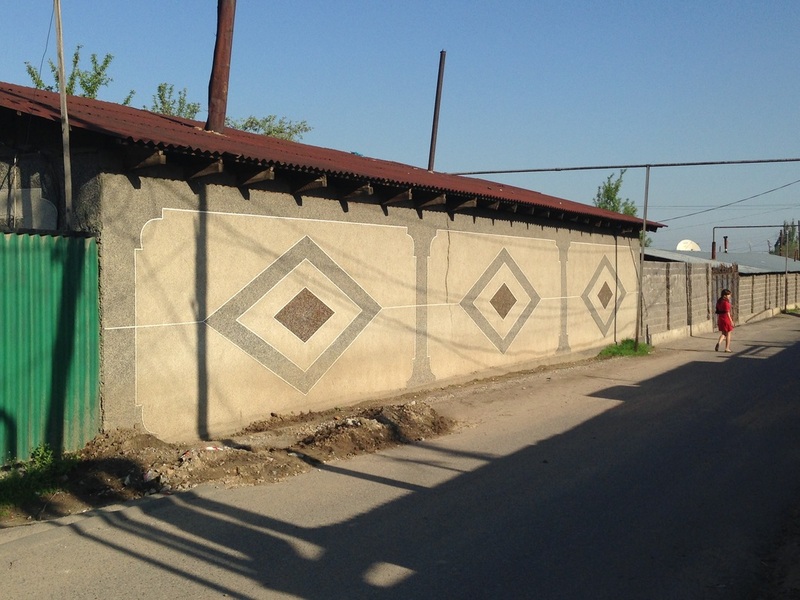 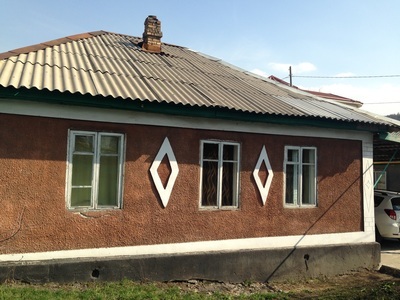 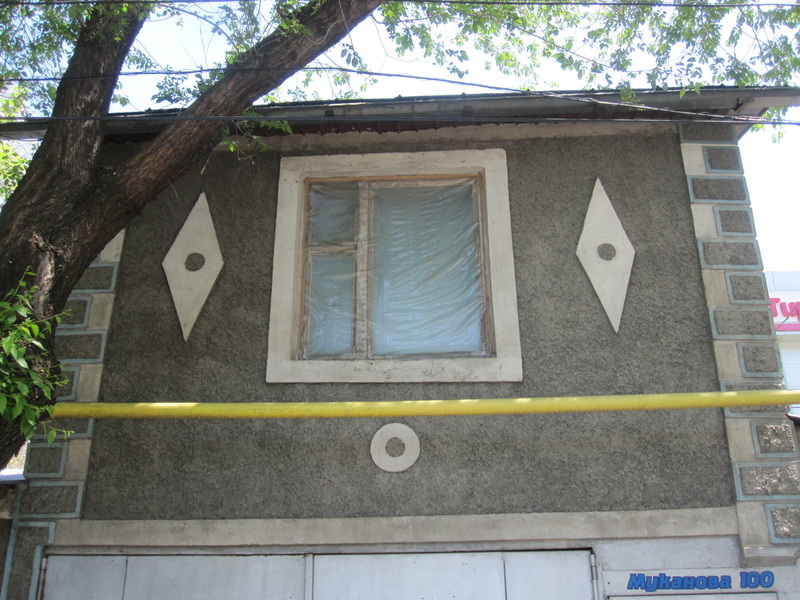 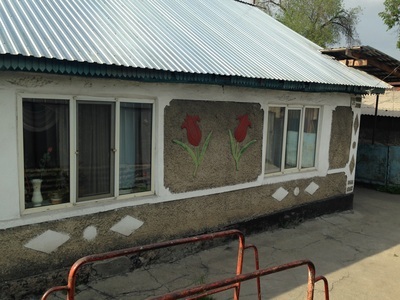 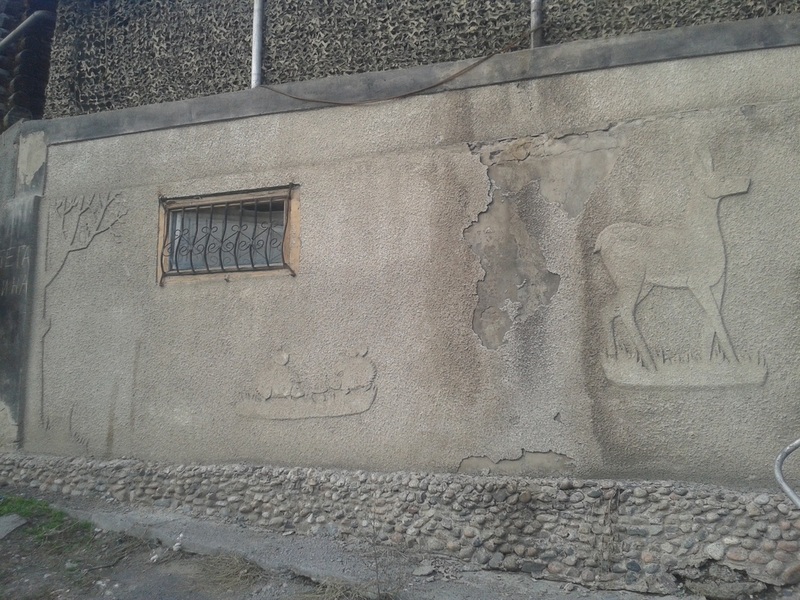 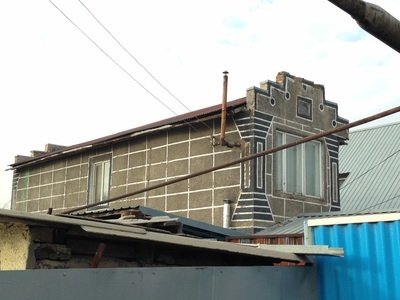 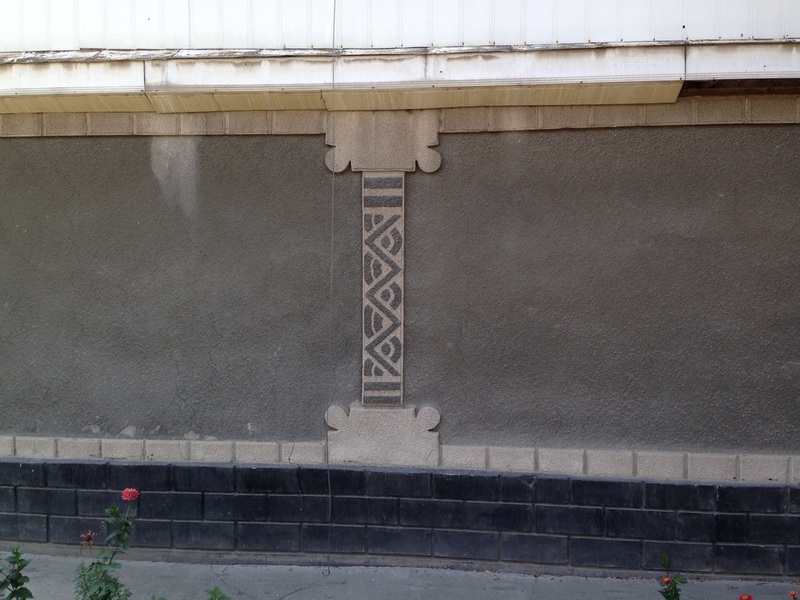 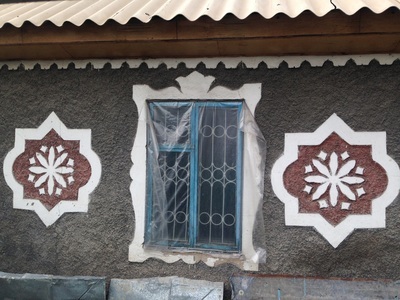 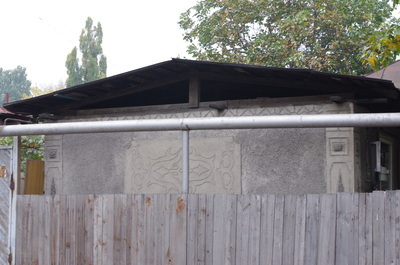 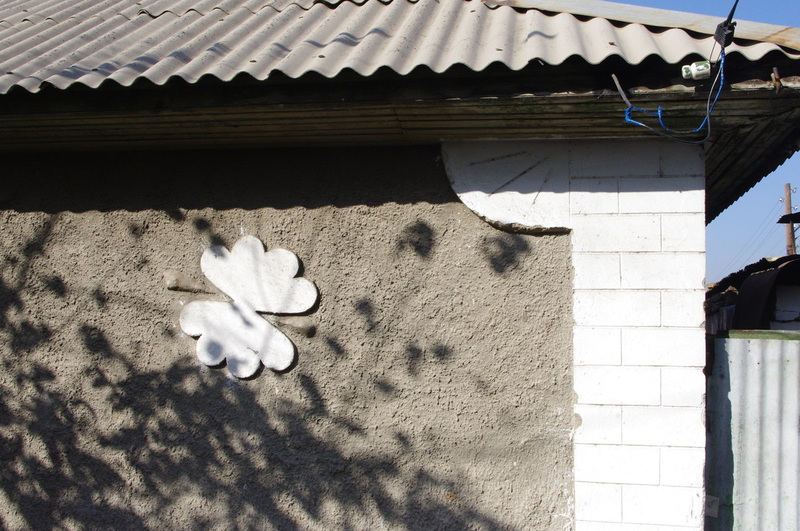 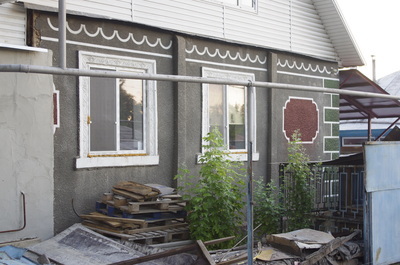 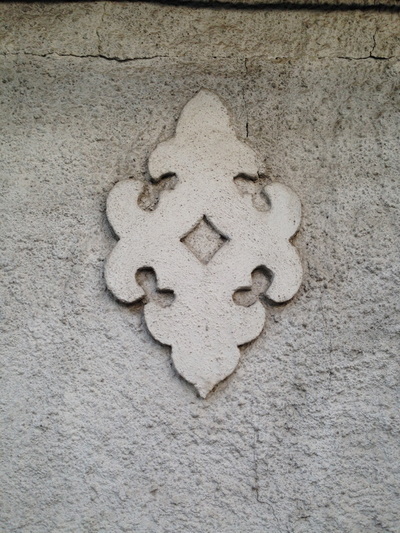 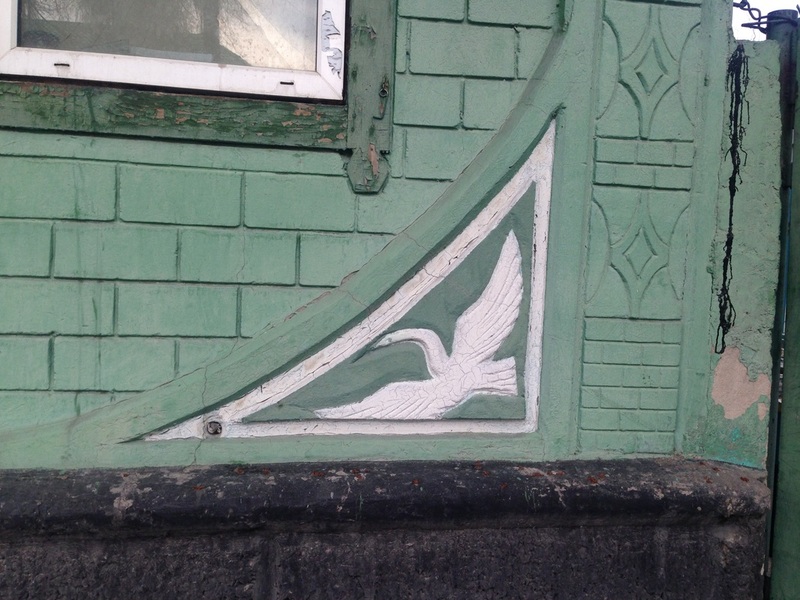 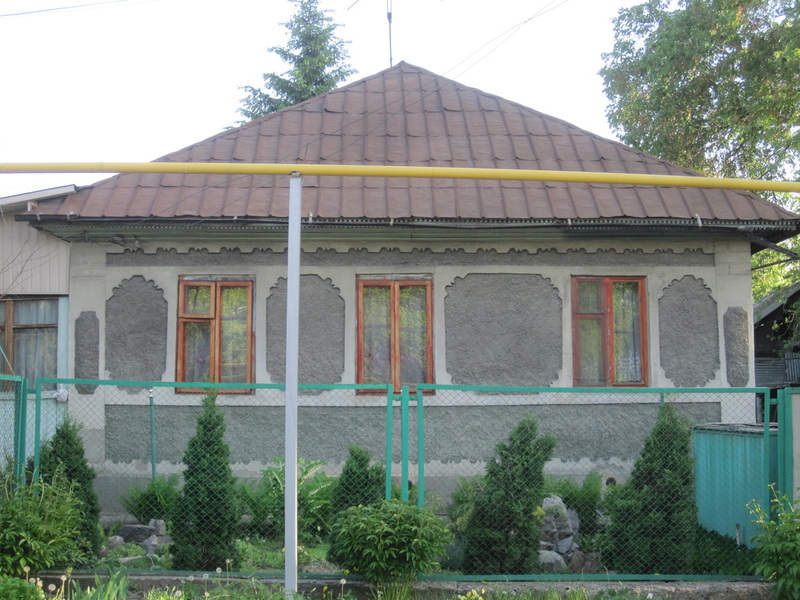 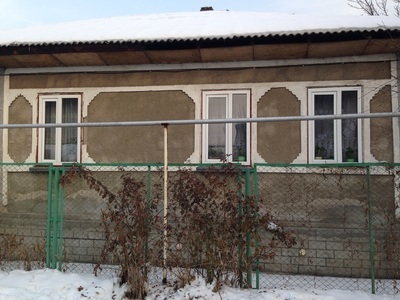 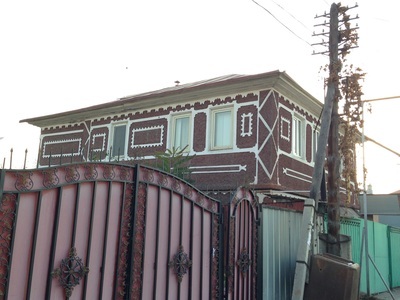 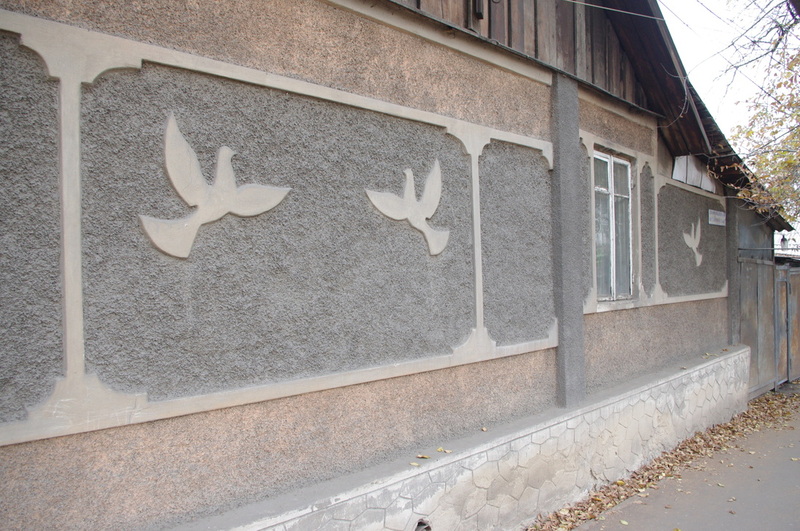 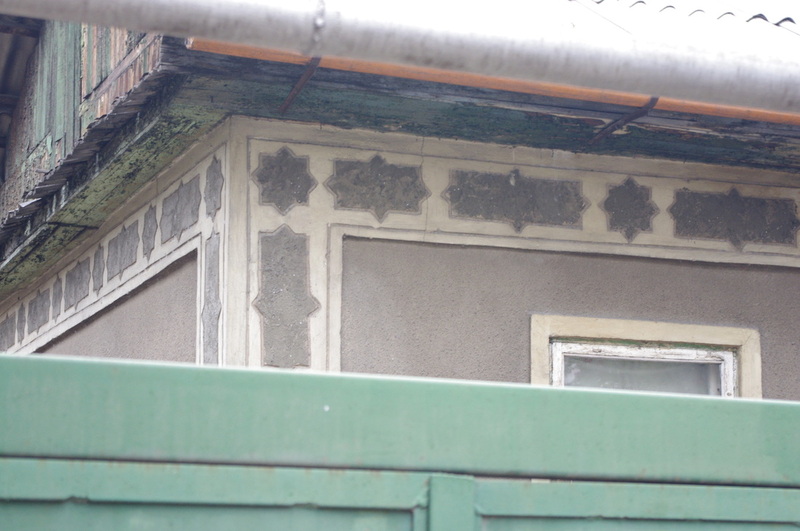 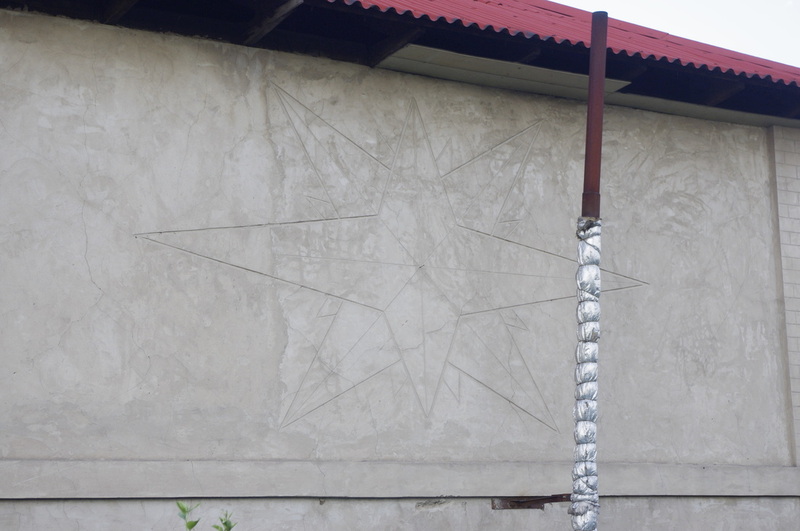 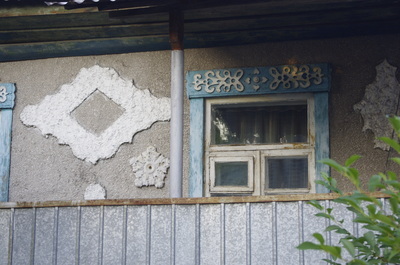 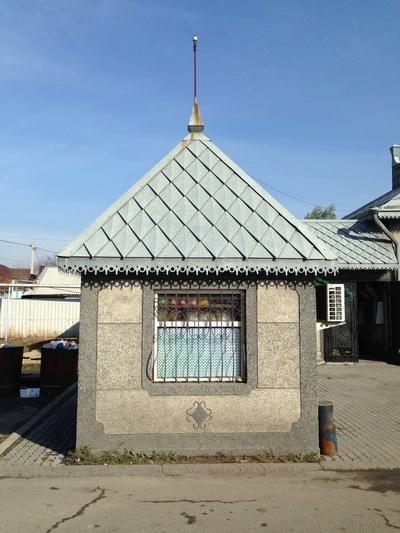 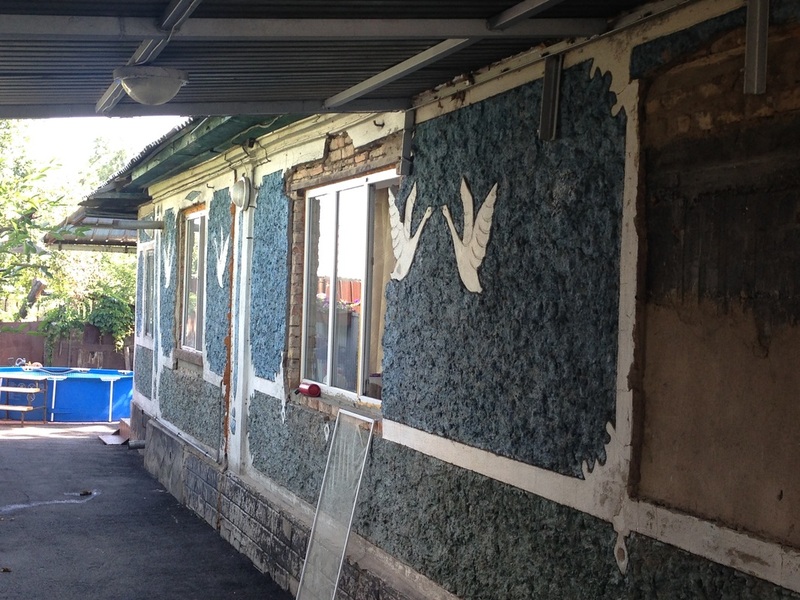 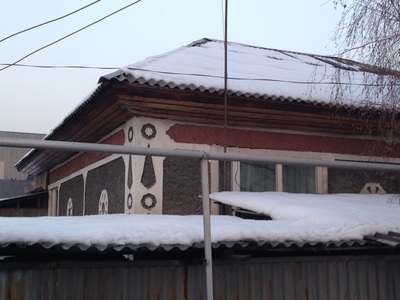 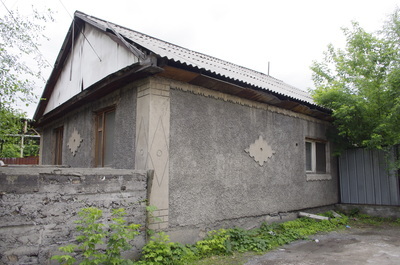 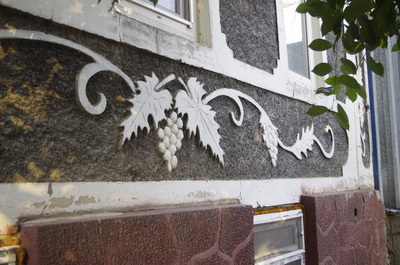 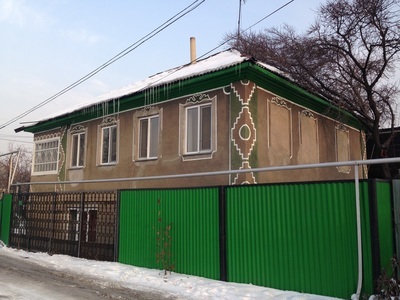 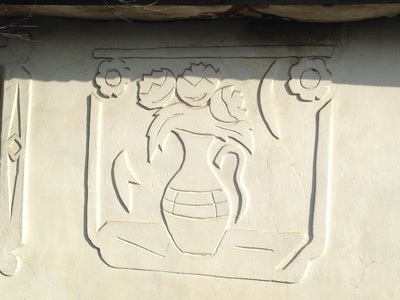 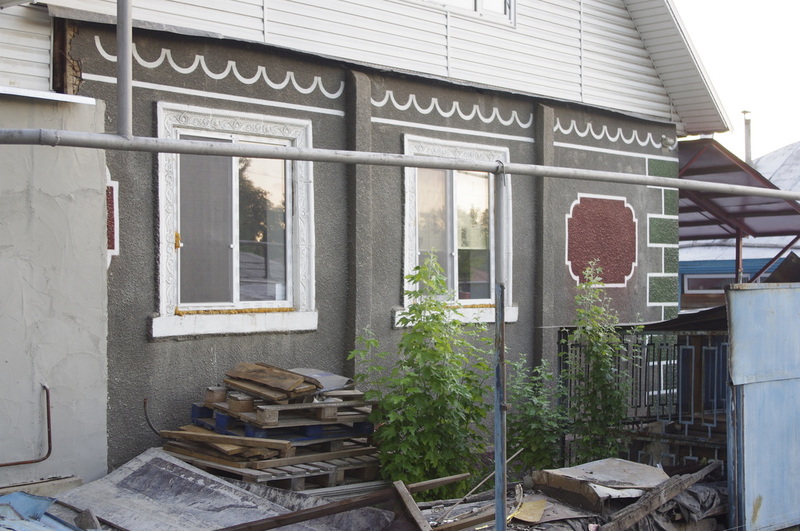 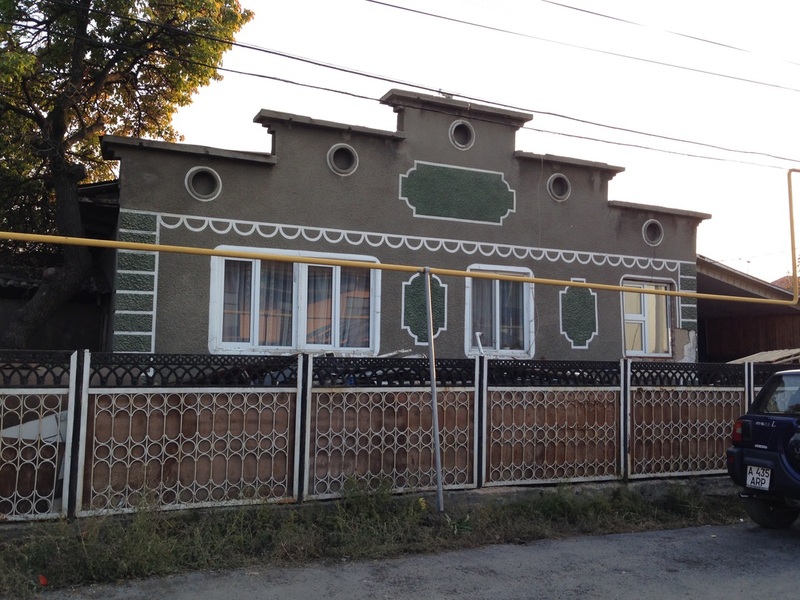 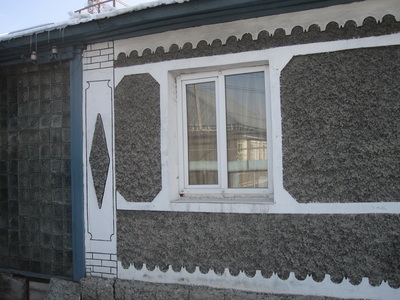 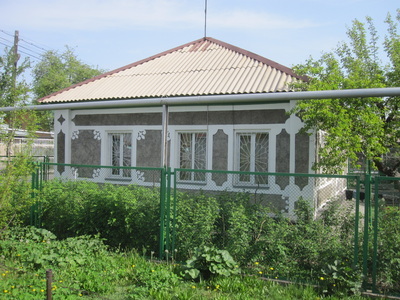 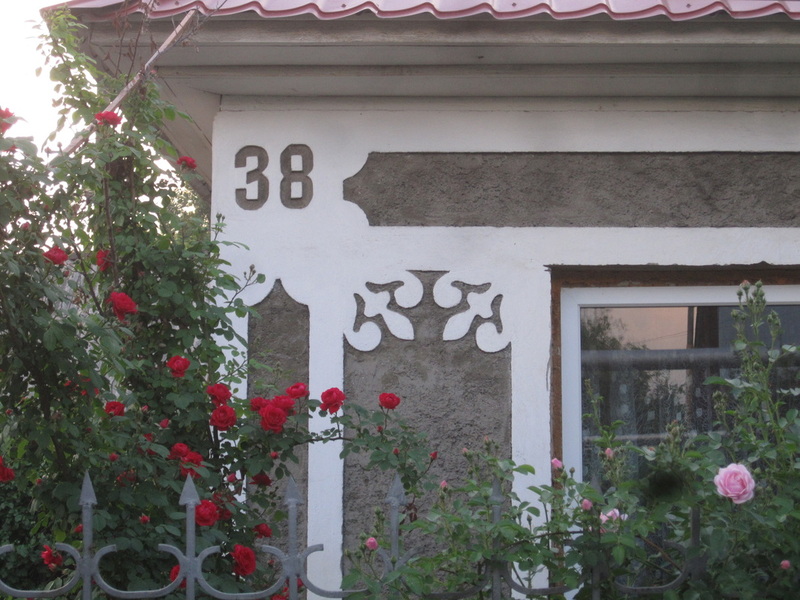 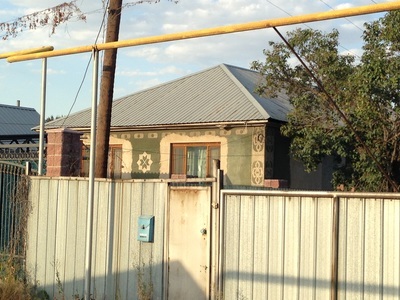 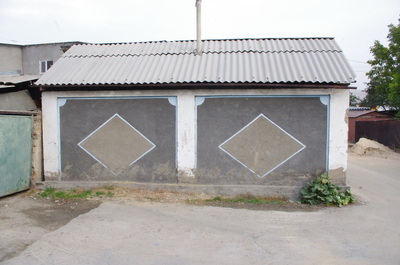 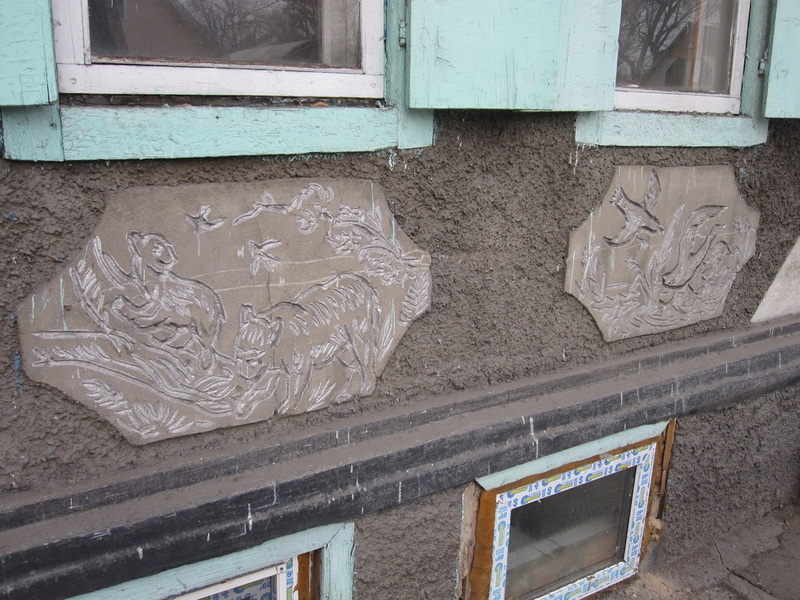 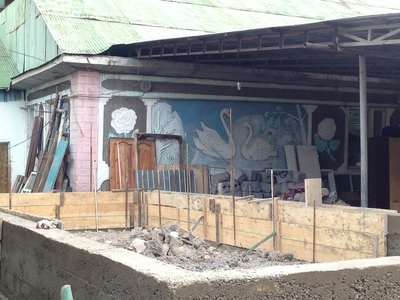 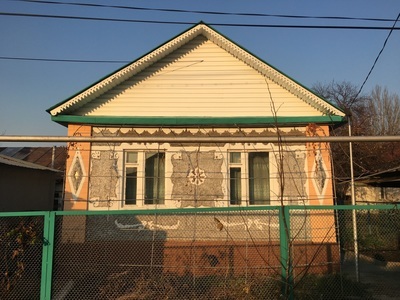 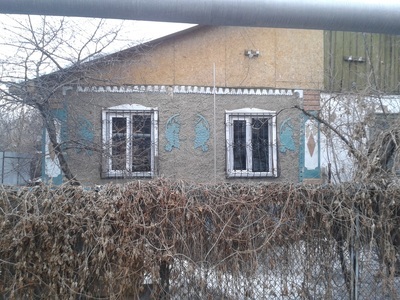 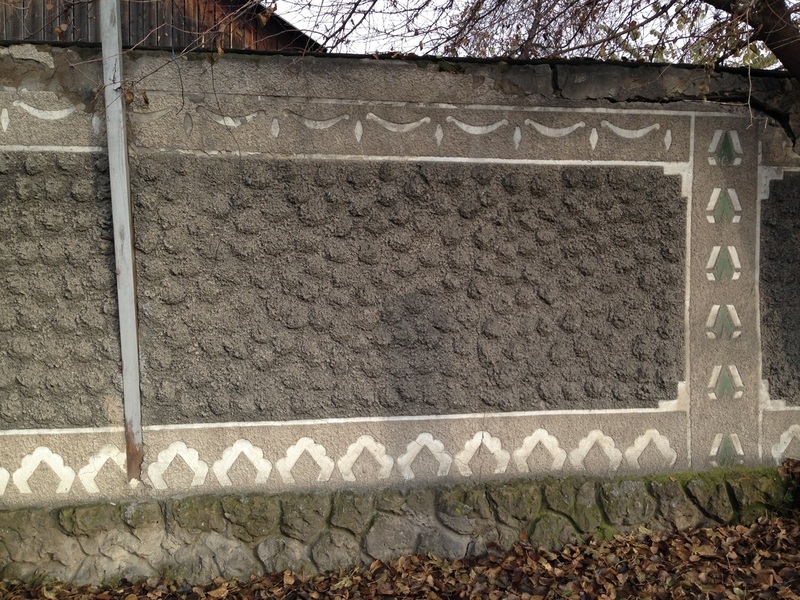 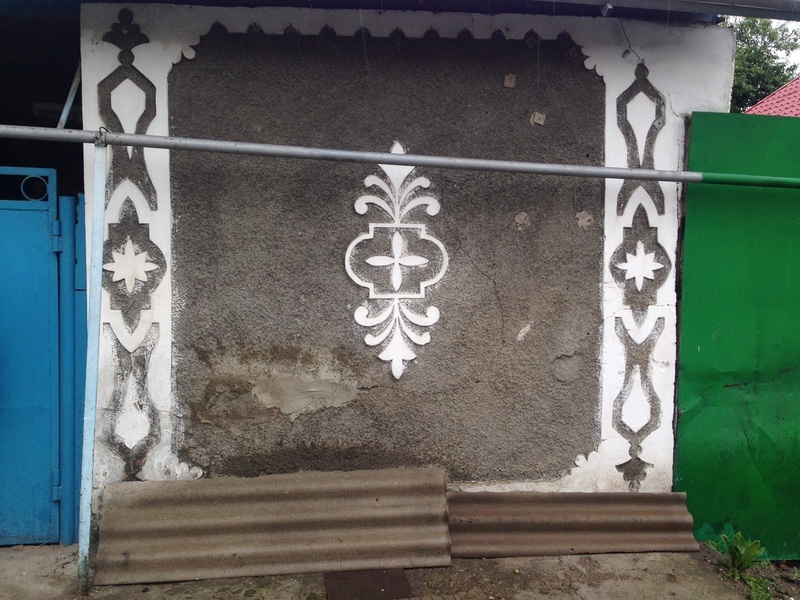 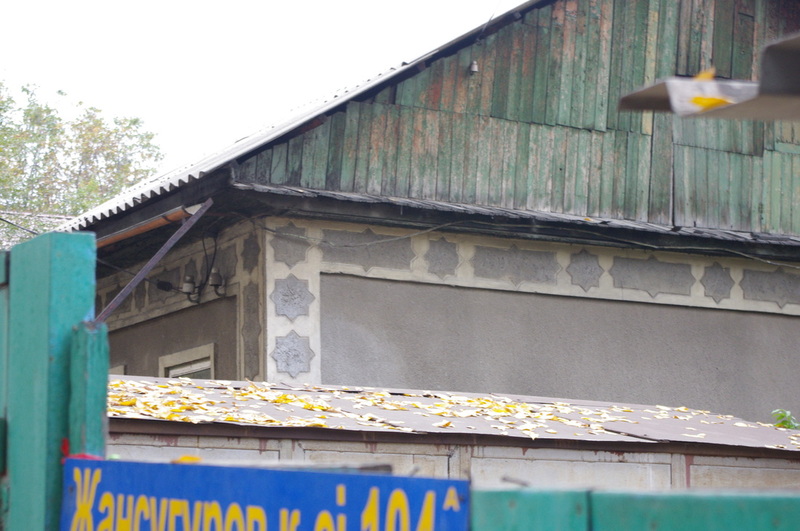 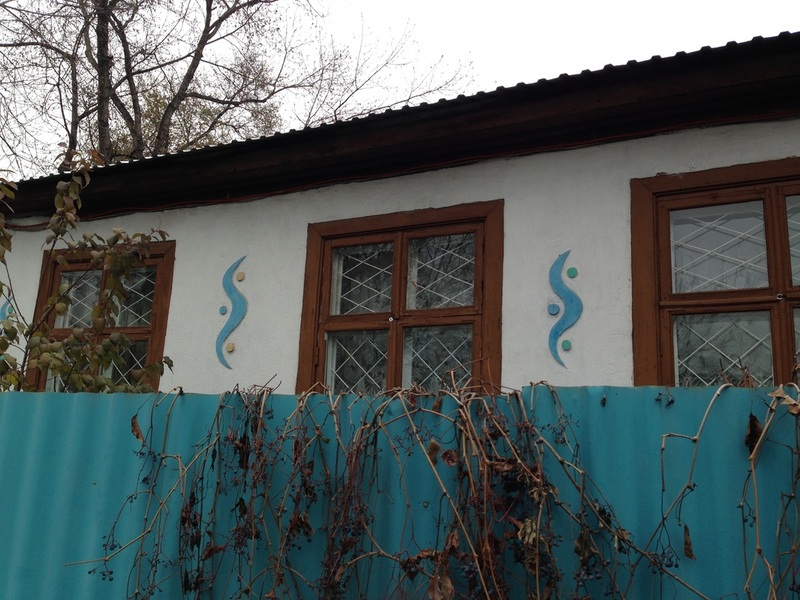 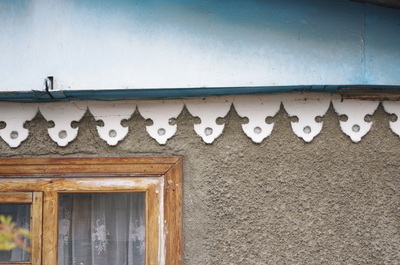 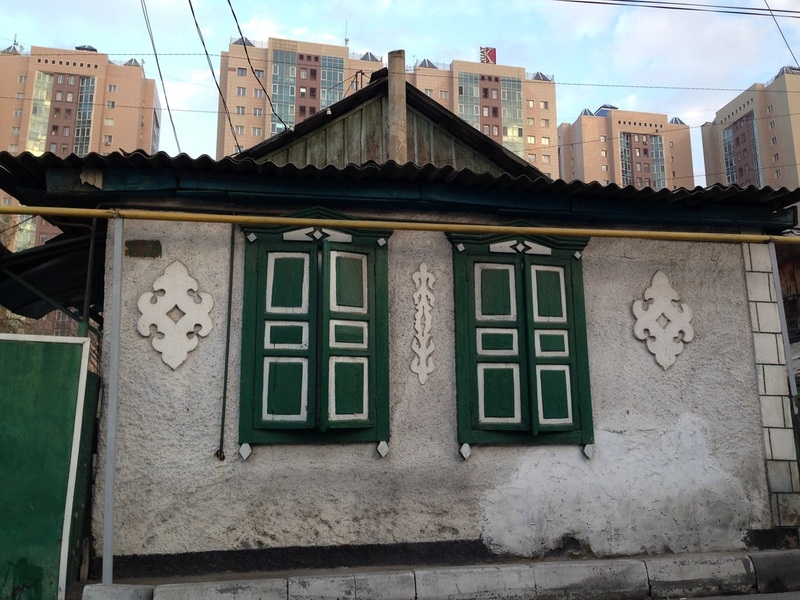 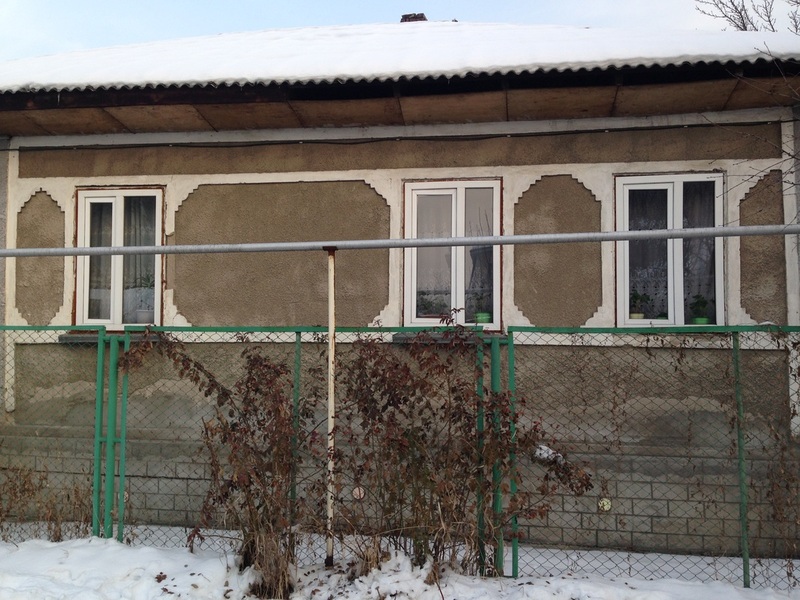 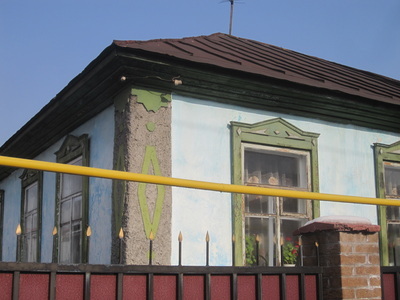 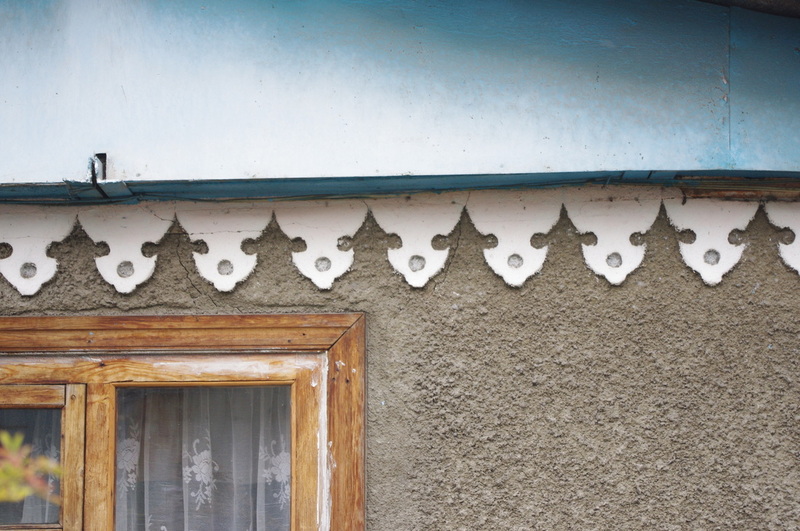 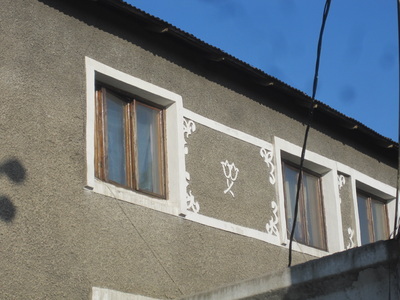 Carved windowframes are sadly a bygone art form in Almaty, but the decorative use of stucco, plaster, and concrete has taken the mantle of the city's premiere vernacular ornament. 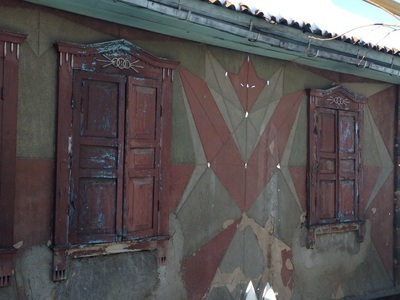 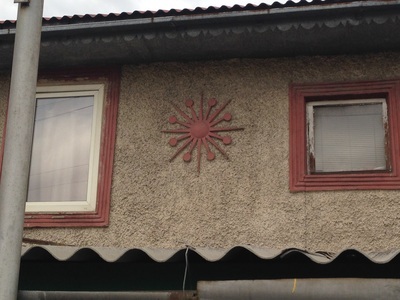 Fifty years ago, homeowners might've added birds, suns, and stars to their facades in glued pieces of carved wood. 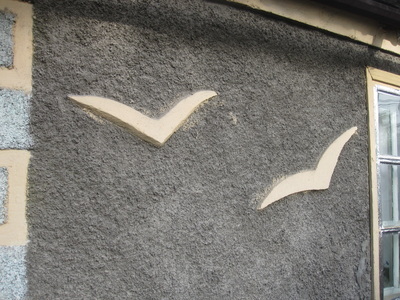 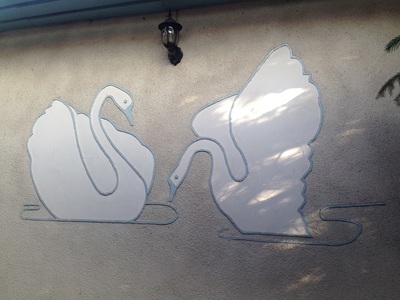 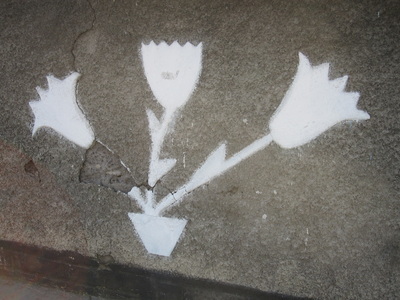 These days they show up as white plaster, set against a wall sprayed with stucco. 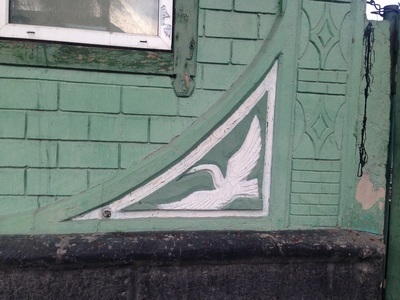 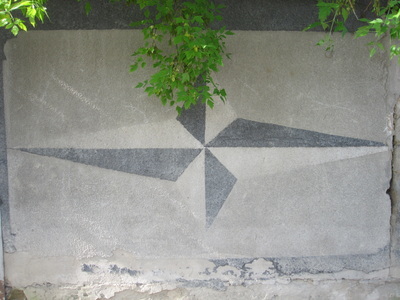 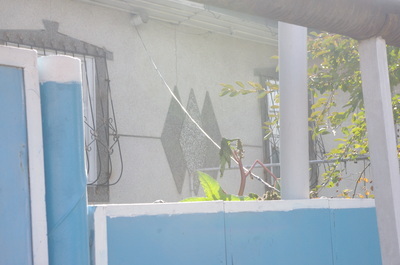 Swans, eagles, deer and squirrels can be found, but even more common are geometrical talismans like stars and rhombi, or molding that wraps around an entire home. Almost every home, it sometimes seems, has decorative plaster, if not some kind of shape on the outer walls then pilasters on the corners. This is one of my largest collections, but the artistic process remains a mystery to me. 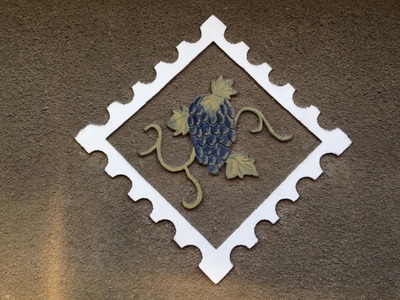 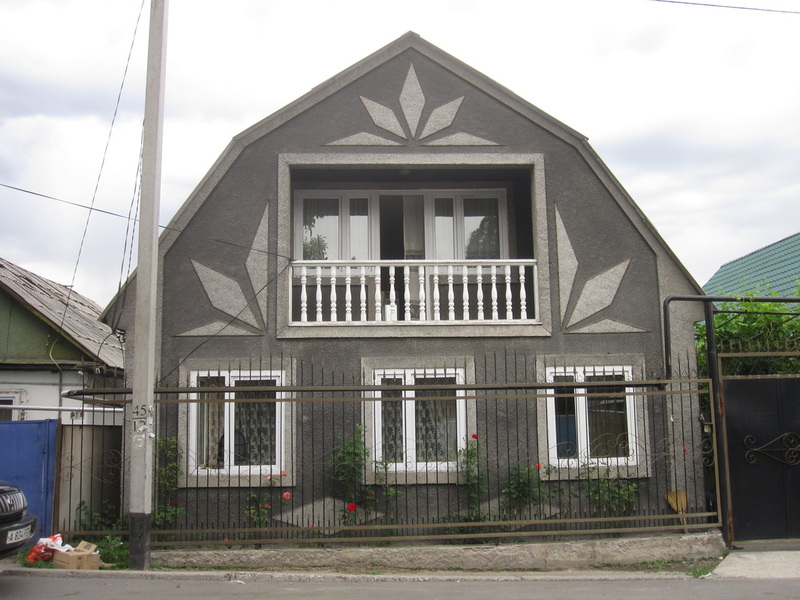 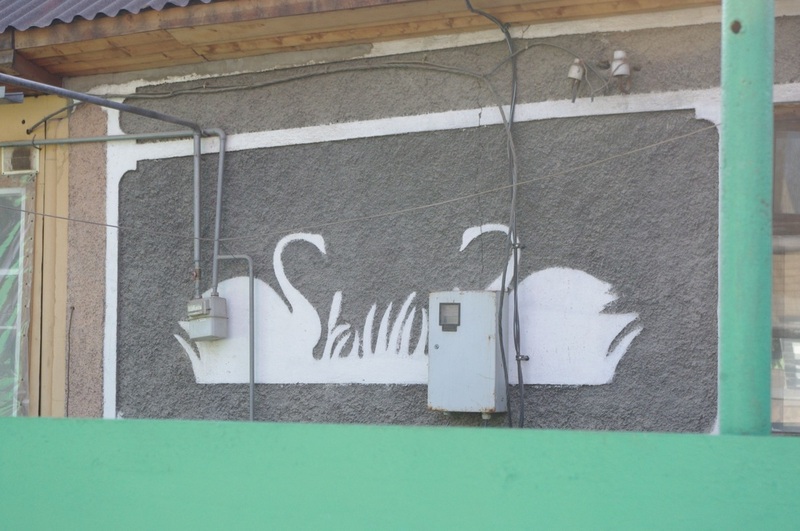 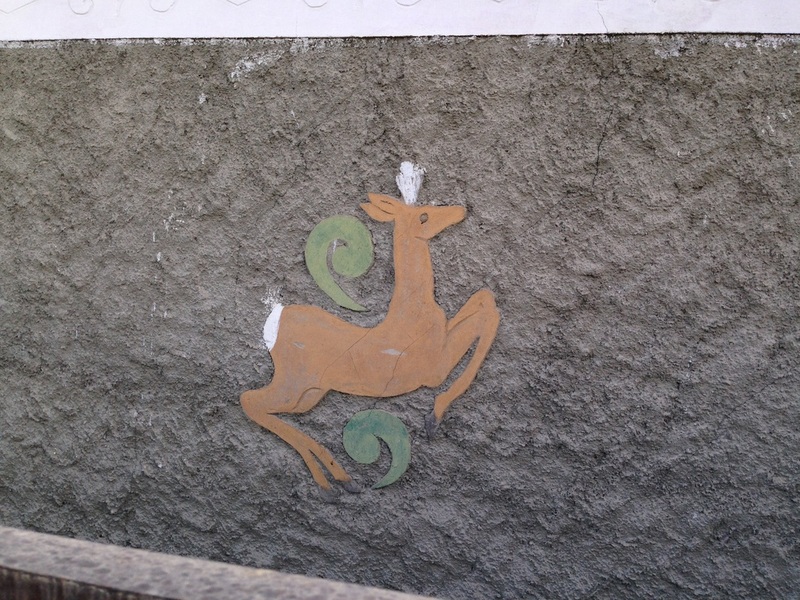 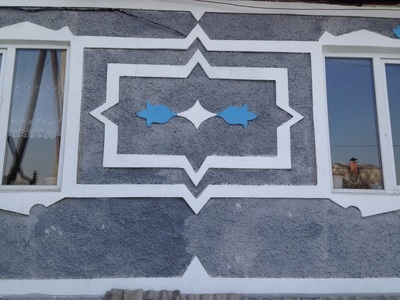 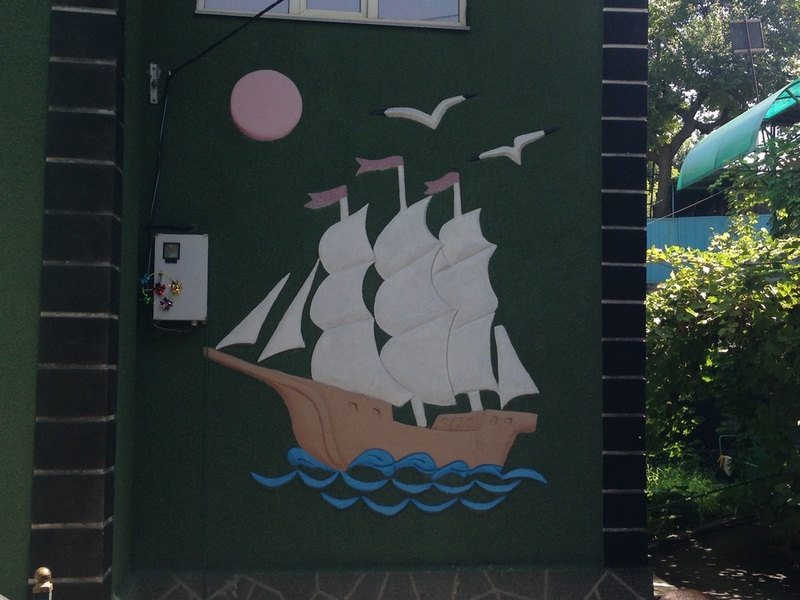 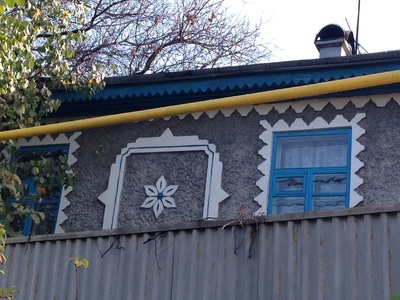 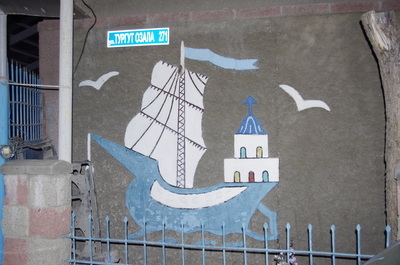 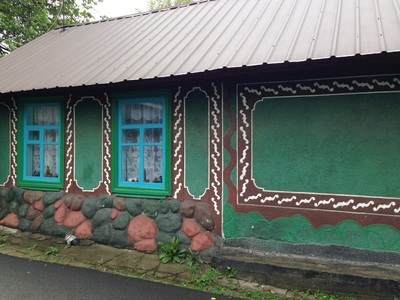 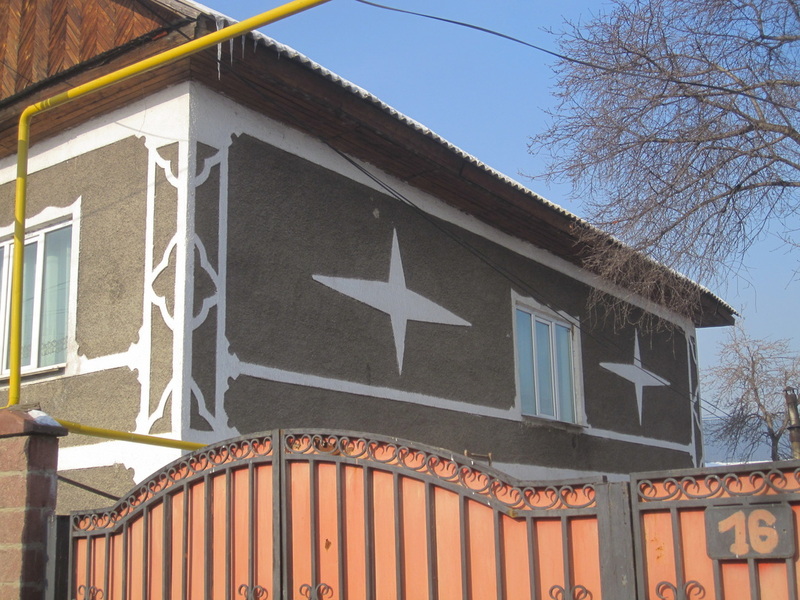 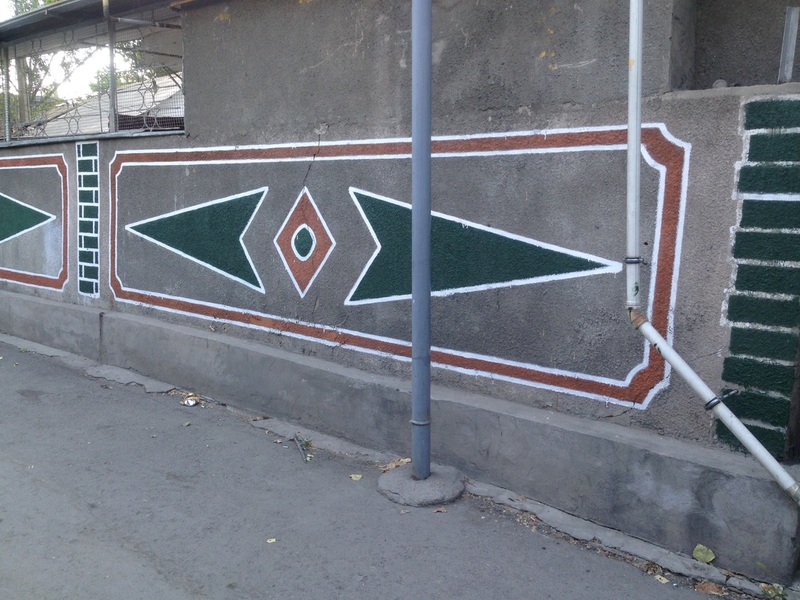 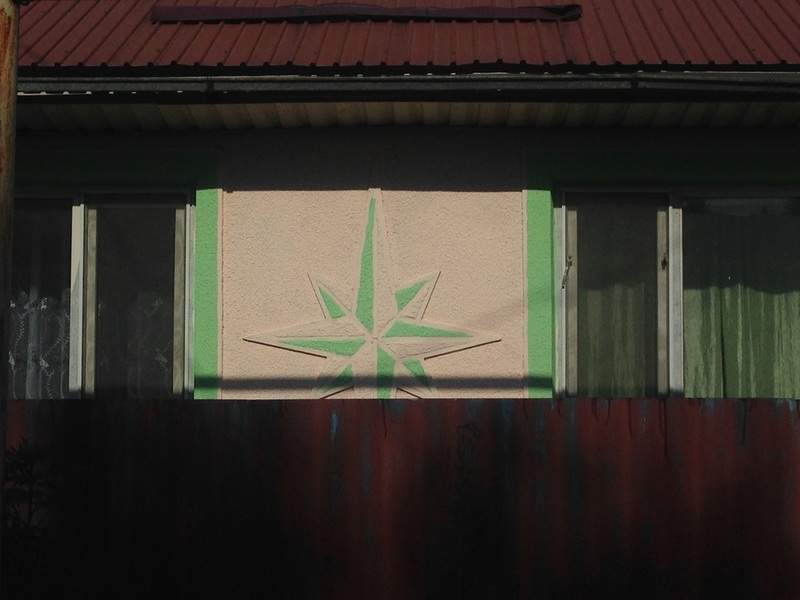 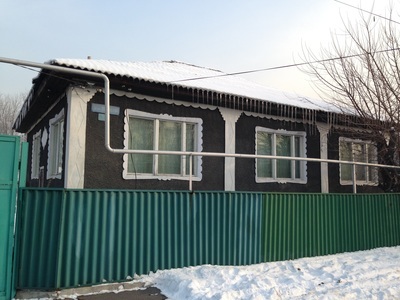 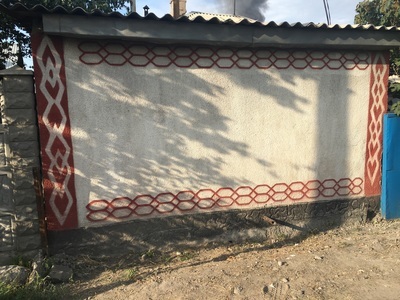 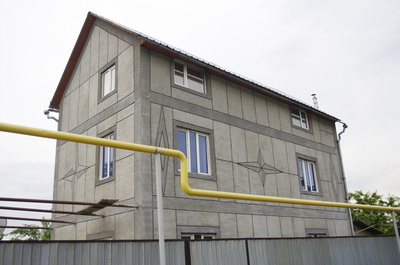 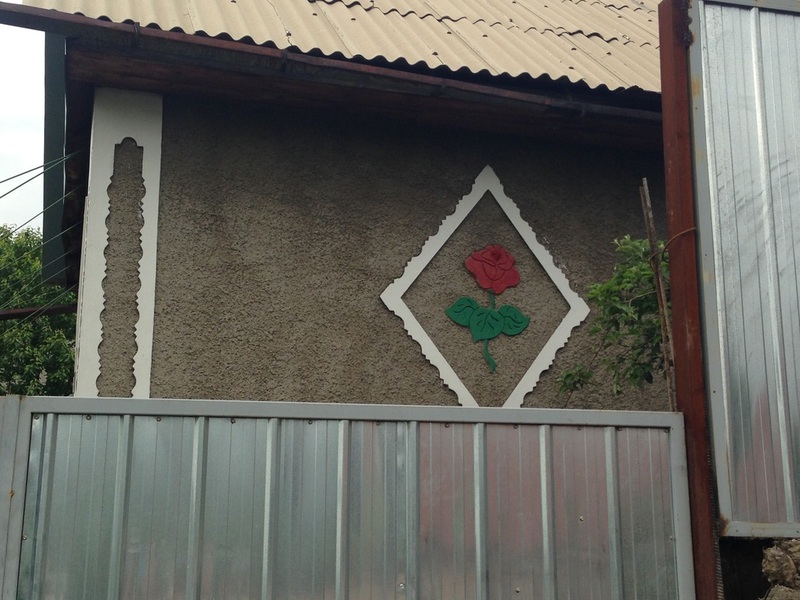 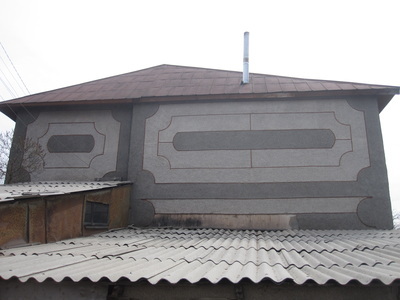 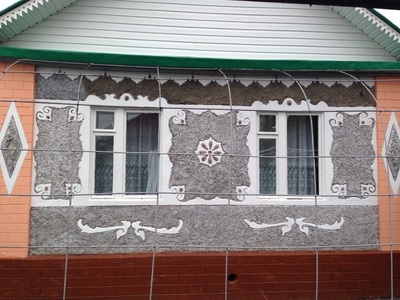 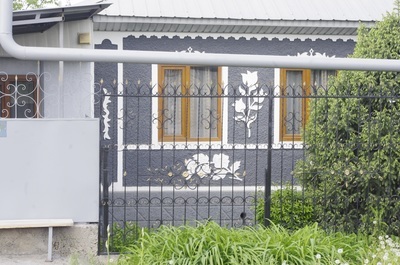 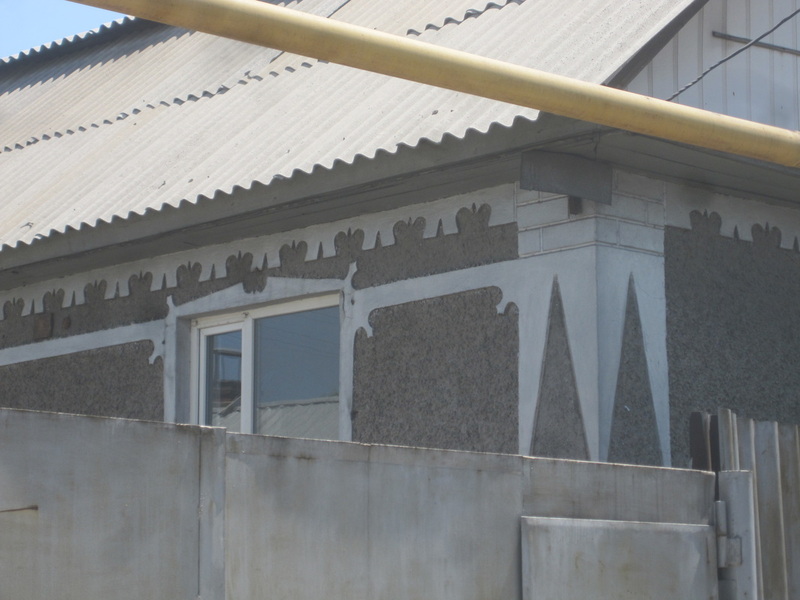 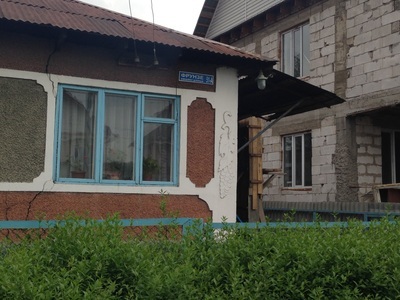 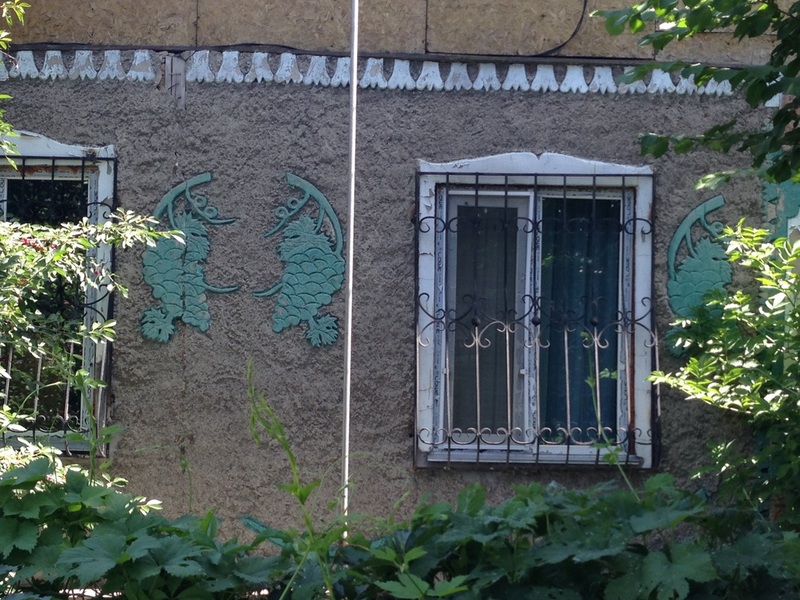 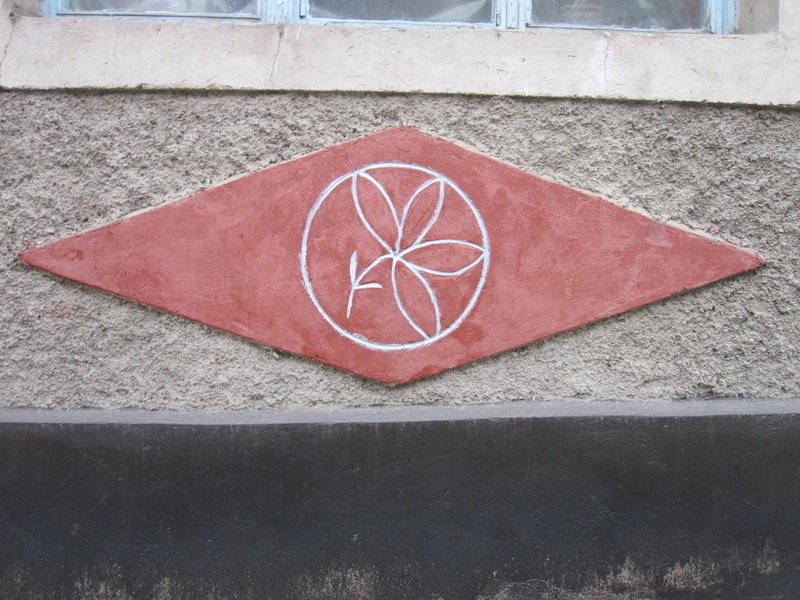 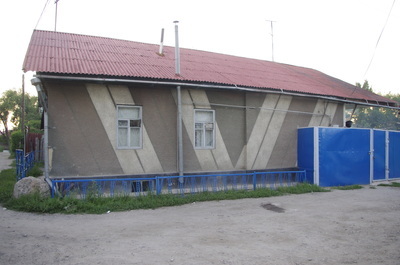 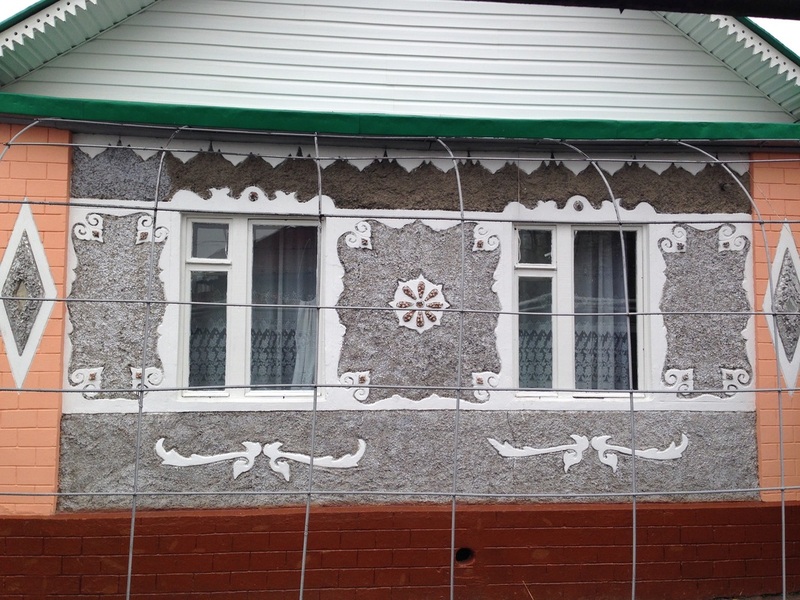 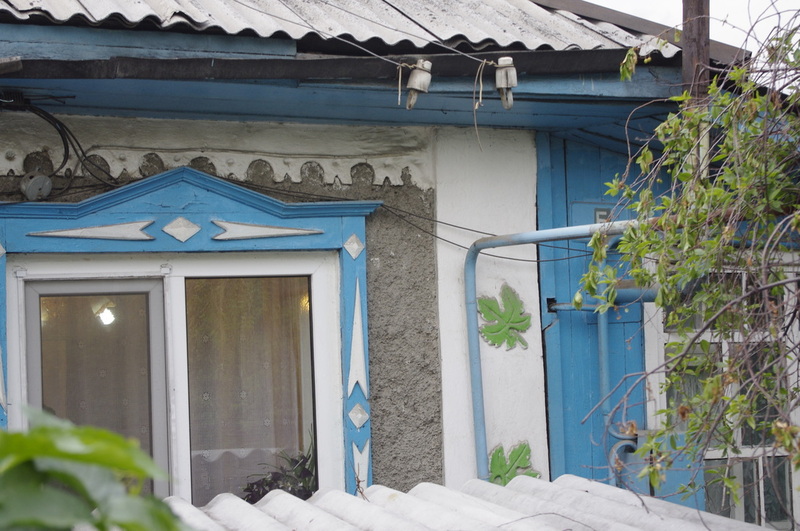 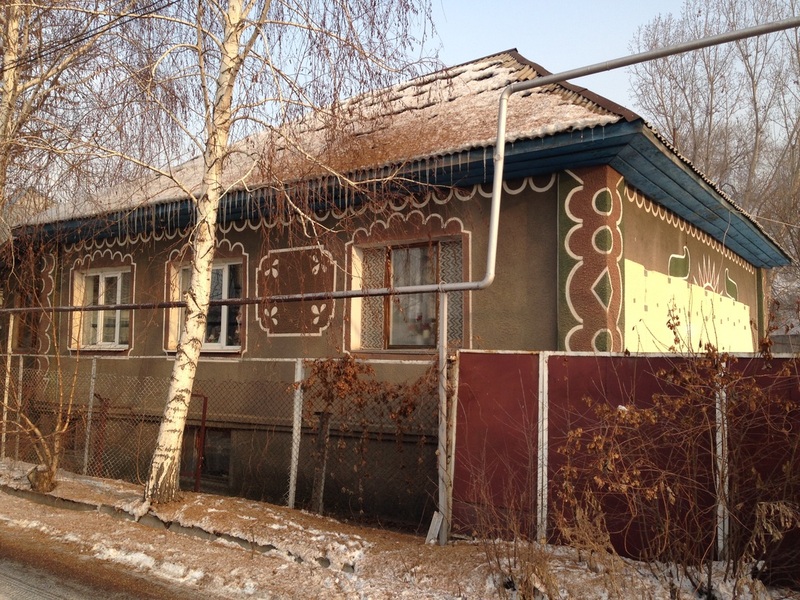 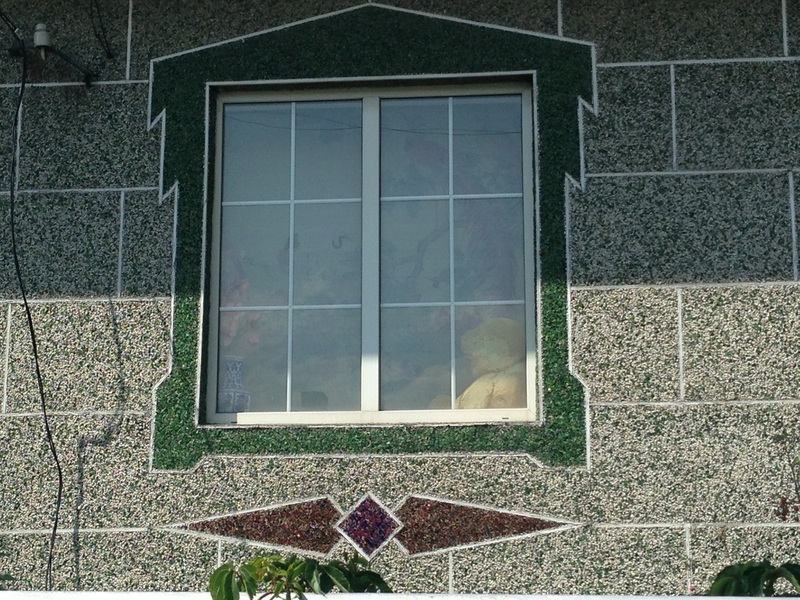 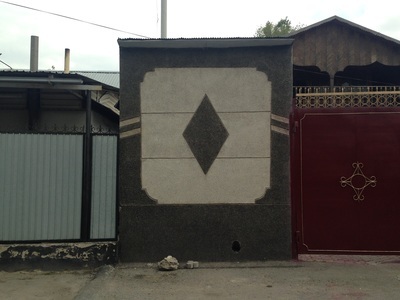 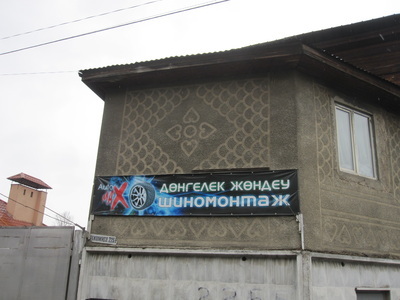 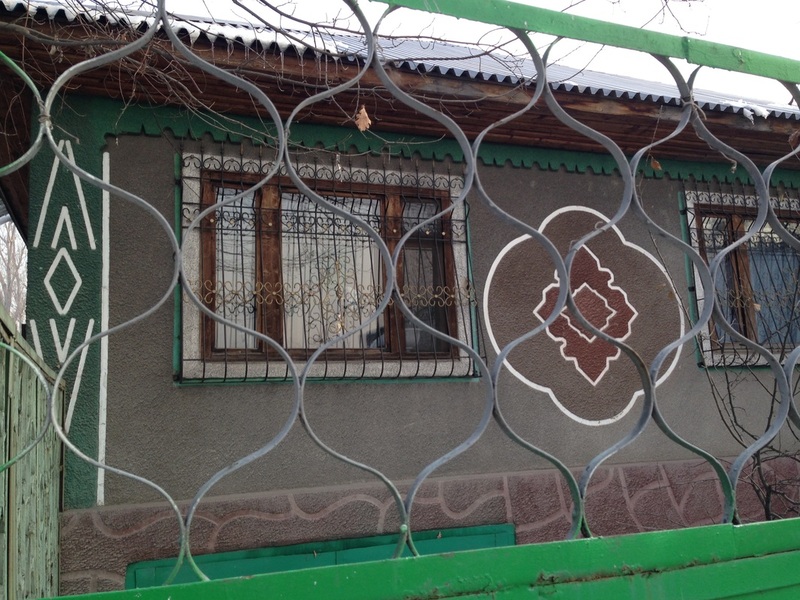 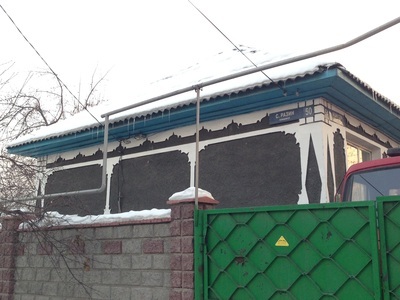 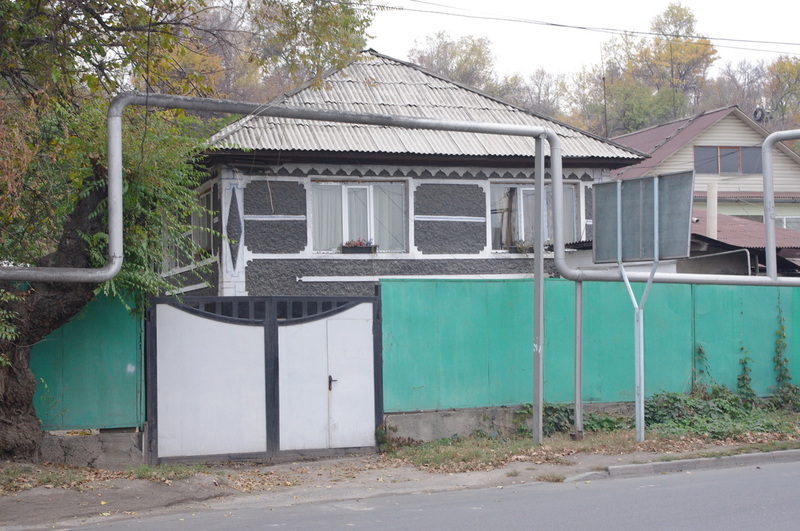 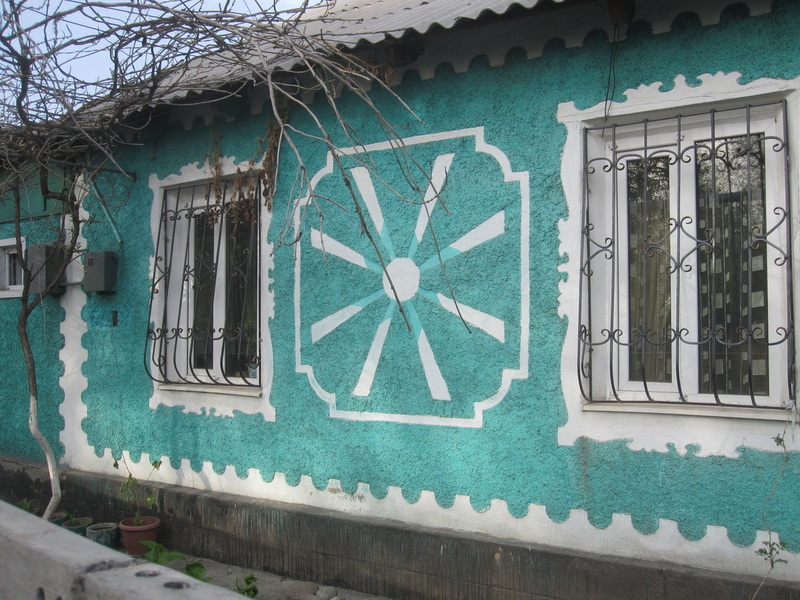 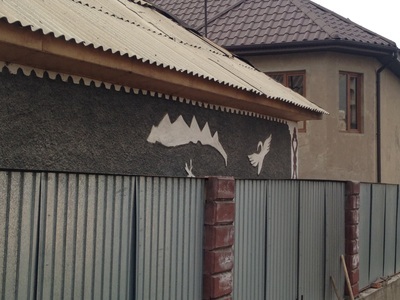 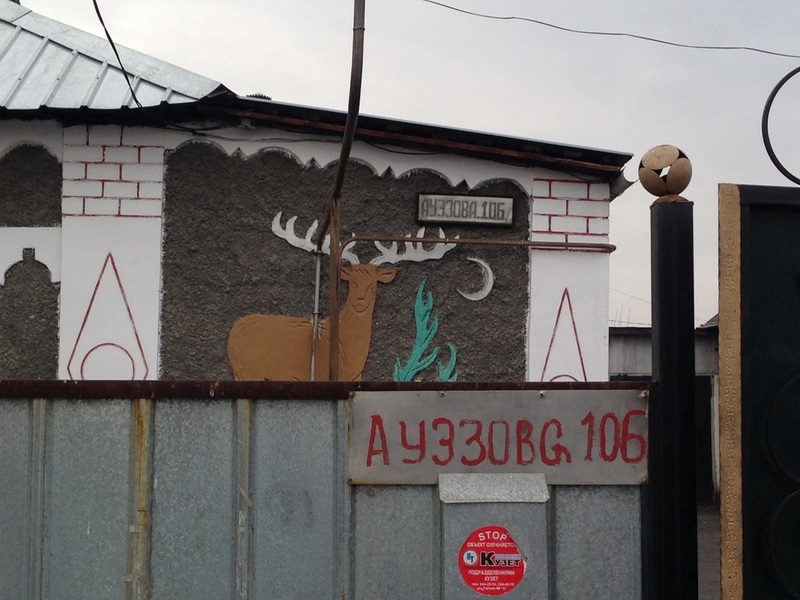 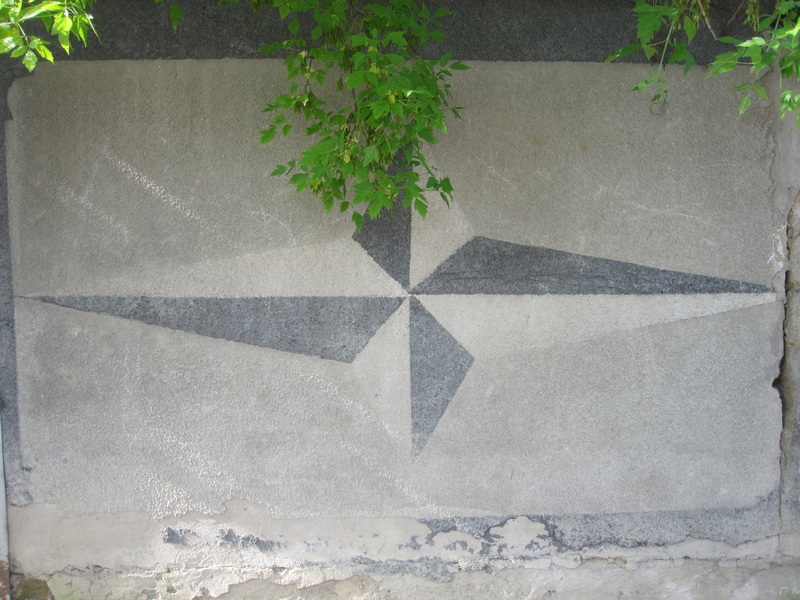 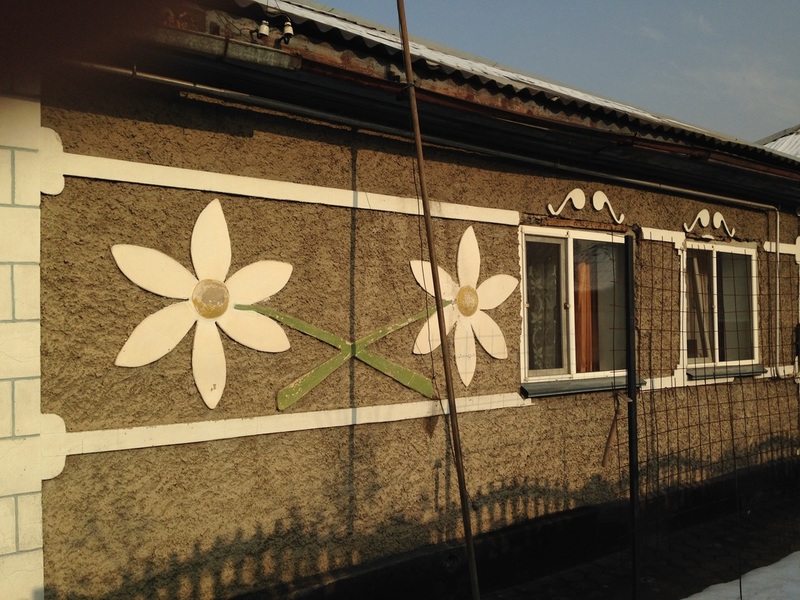 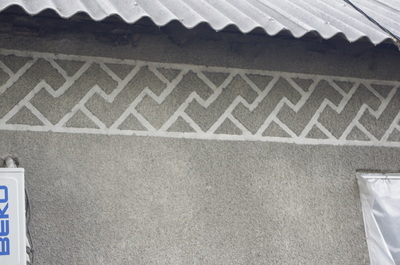 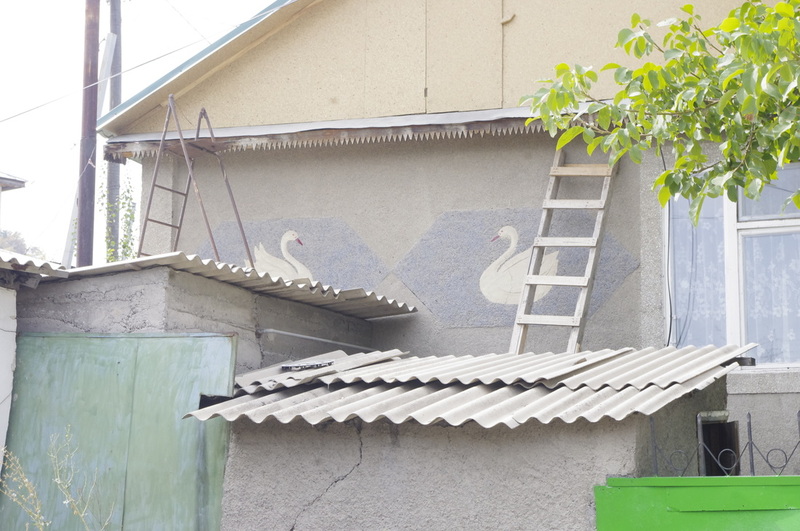 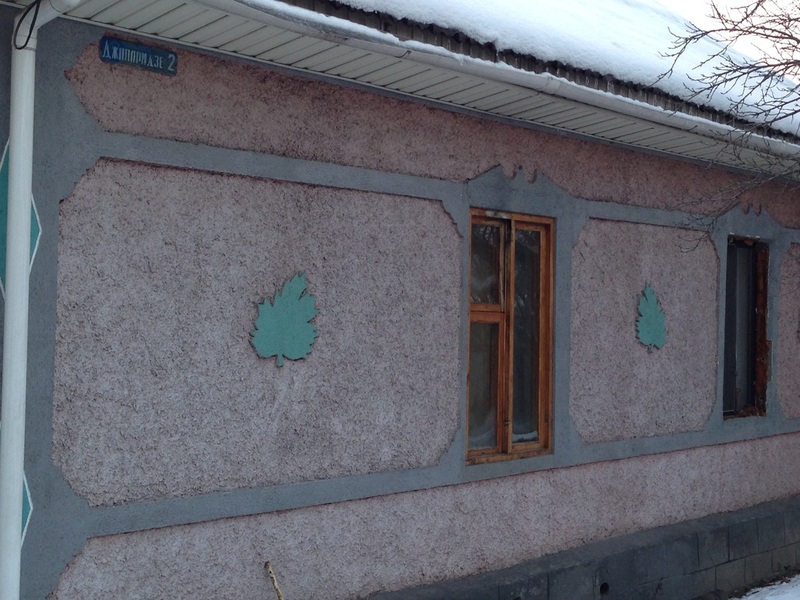 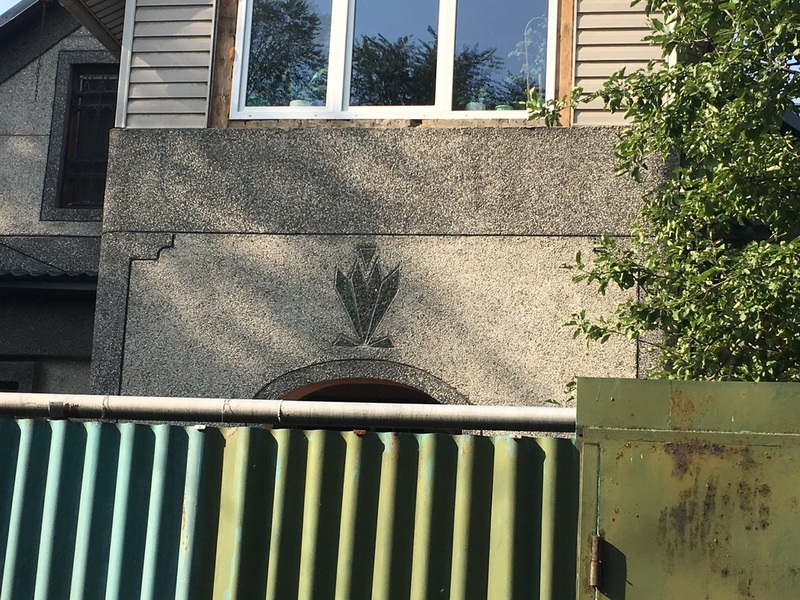 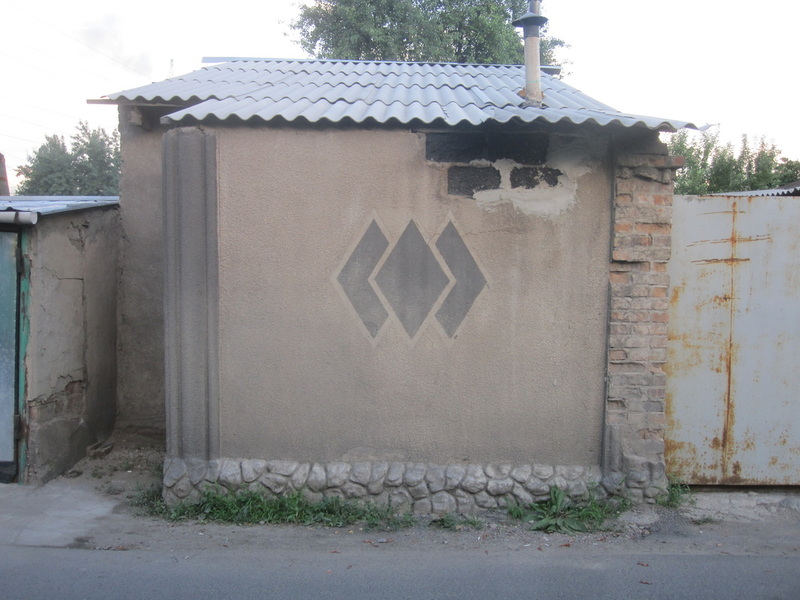 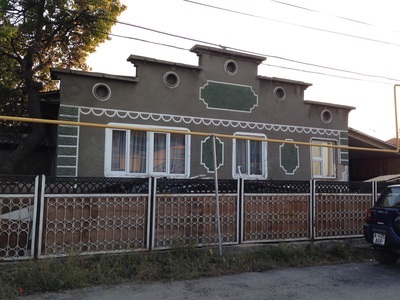 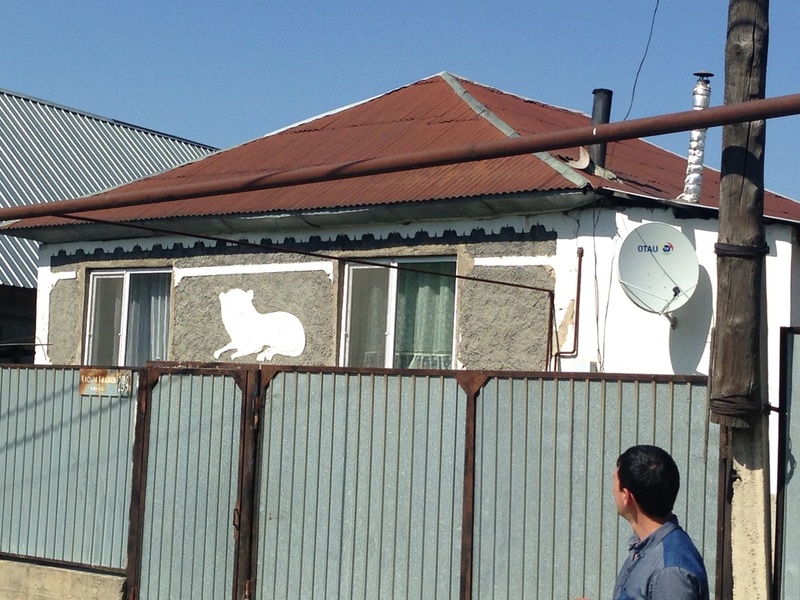 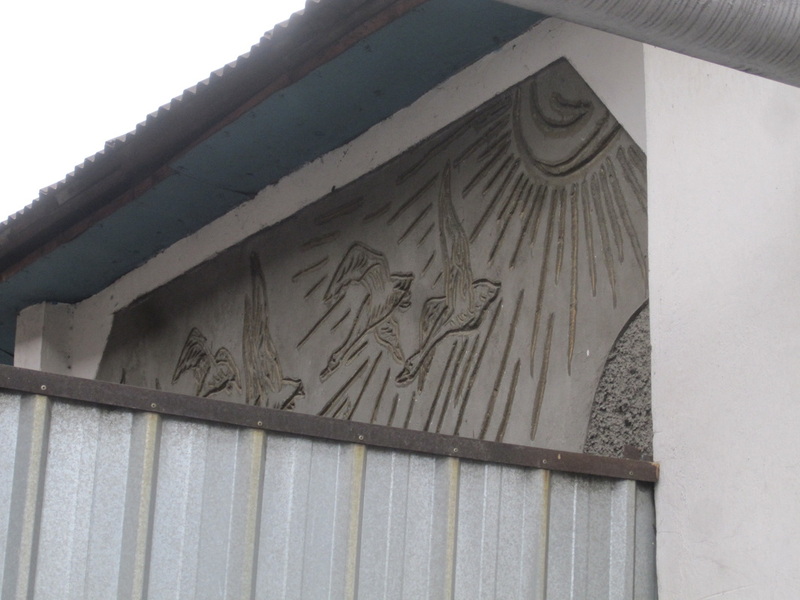 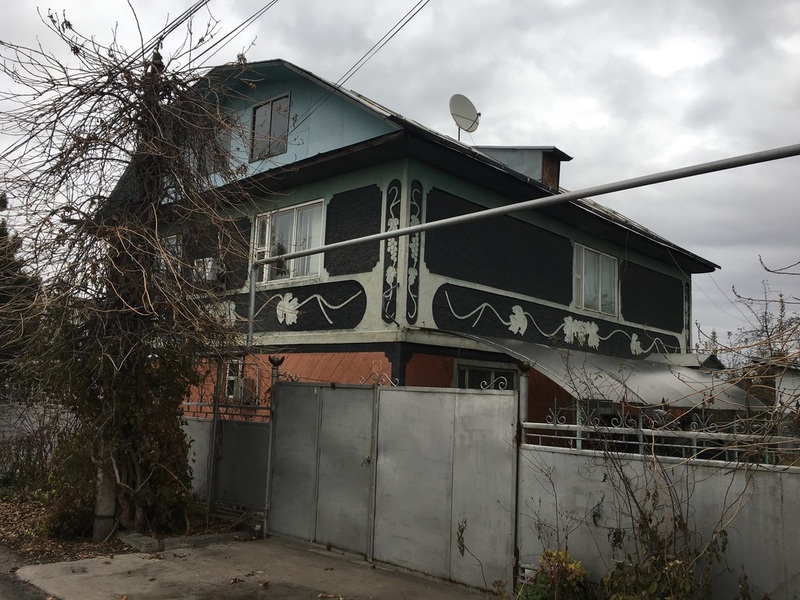 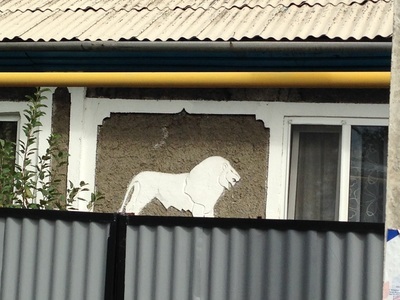 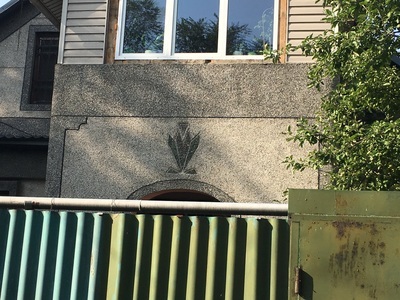 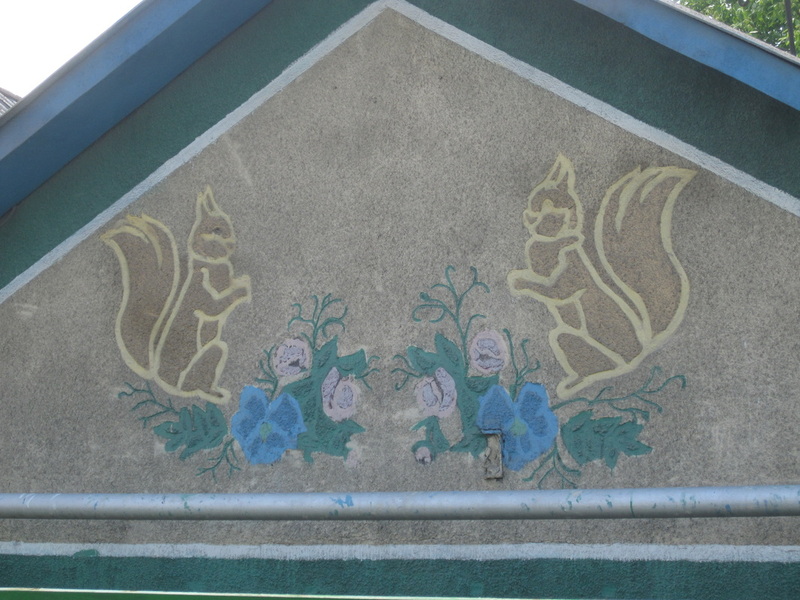 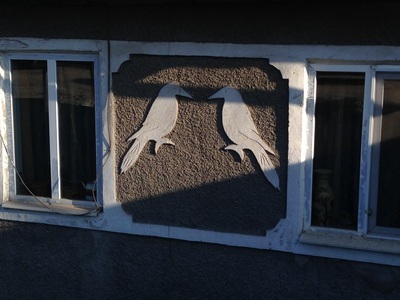 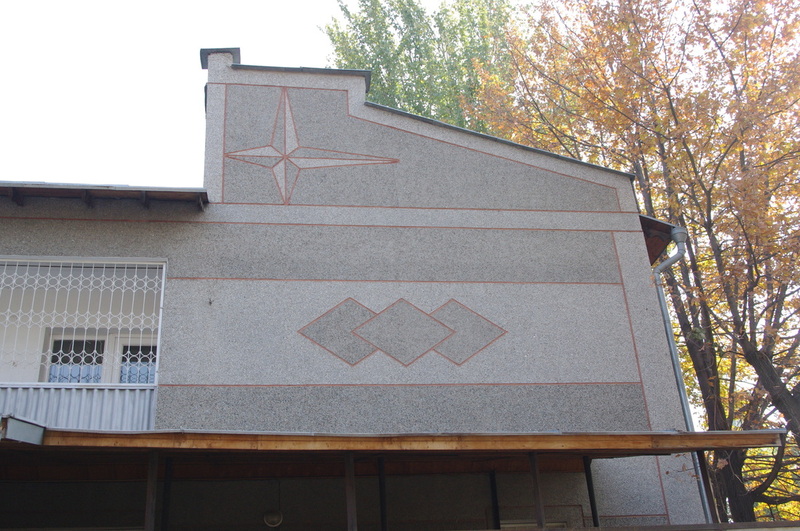 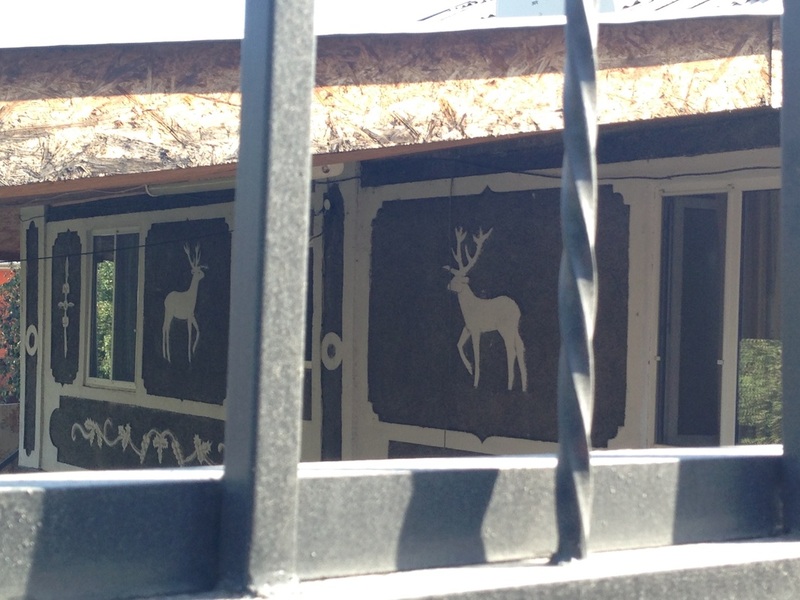 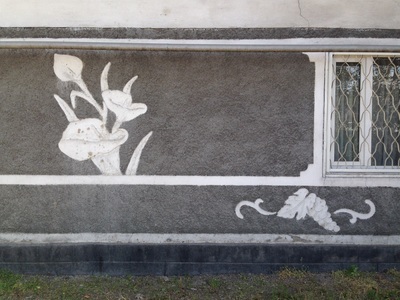 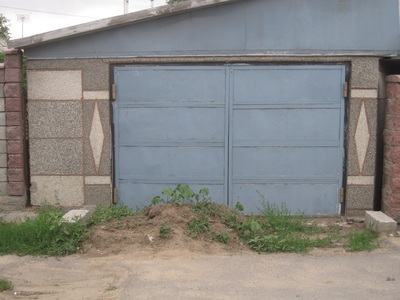 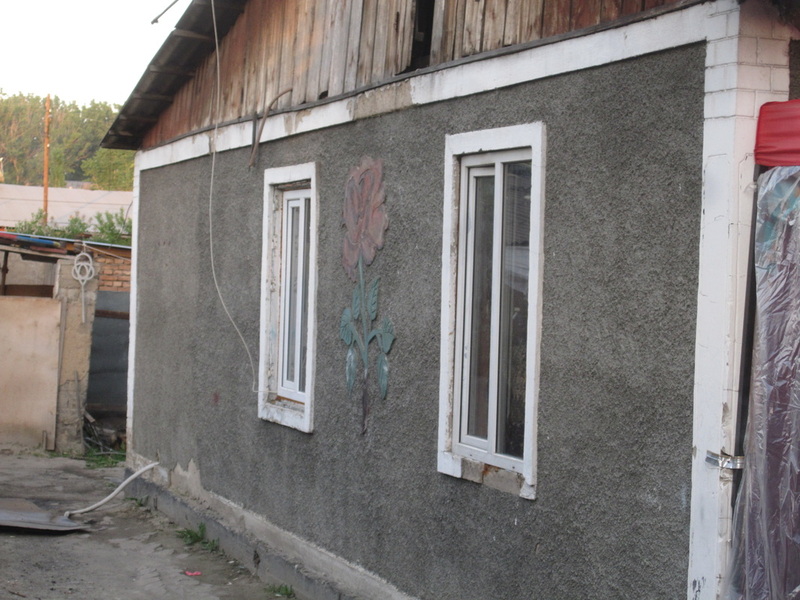 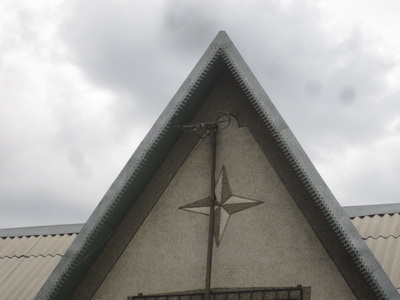 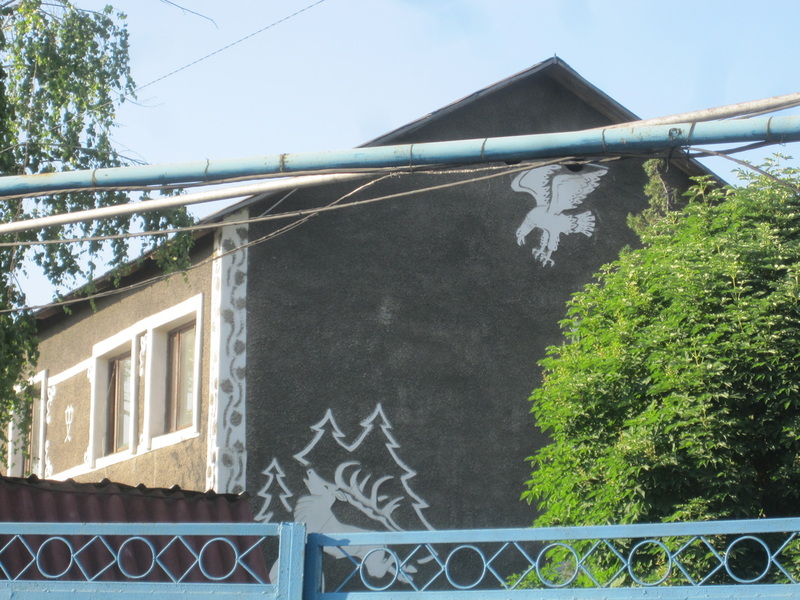 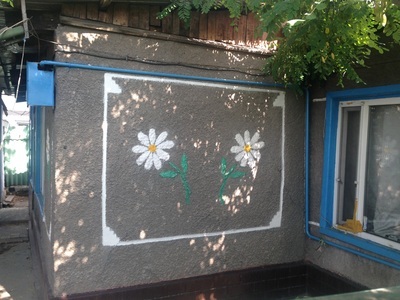 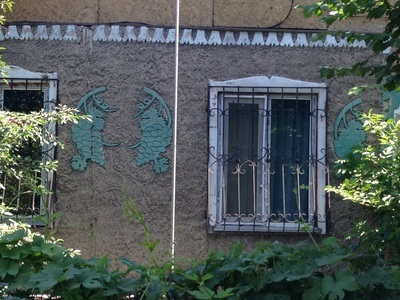 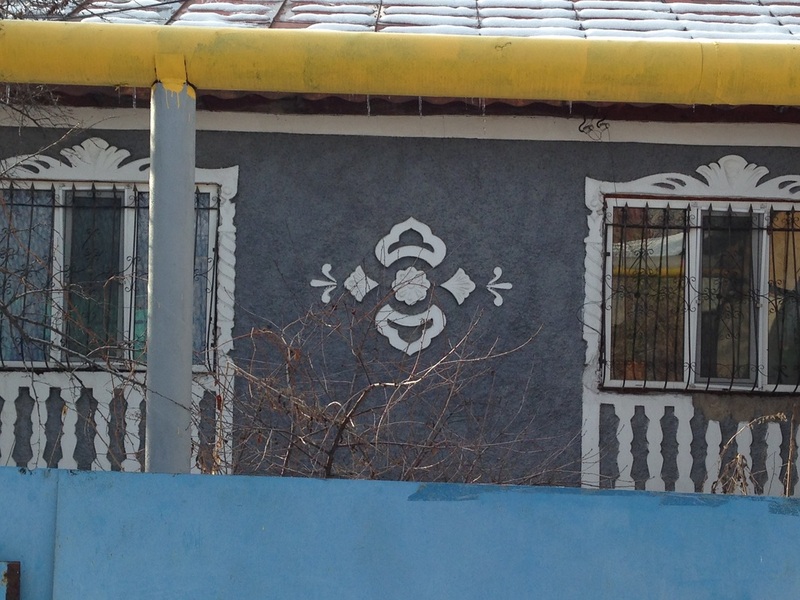 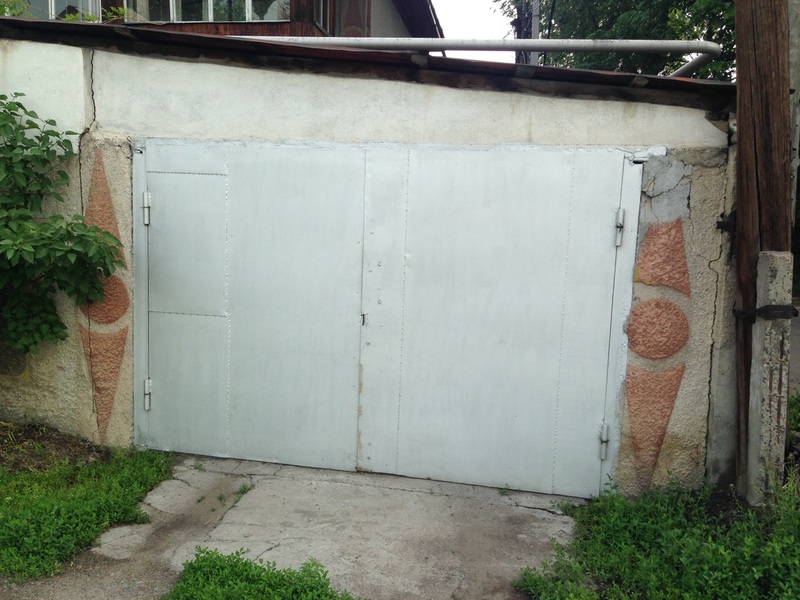 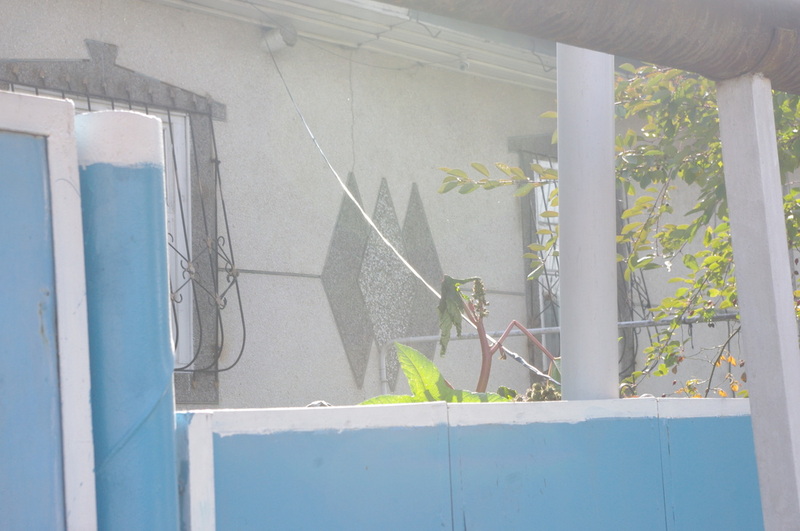 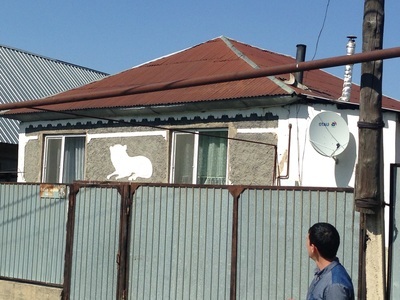 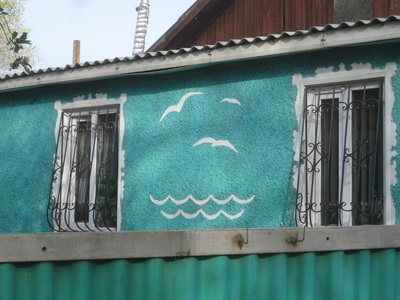 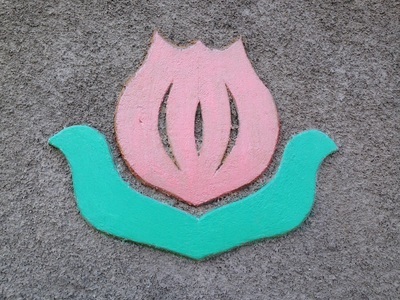 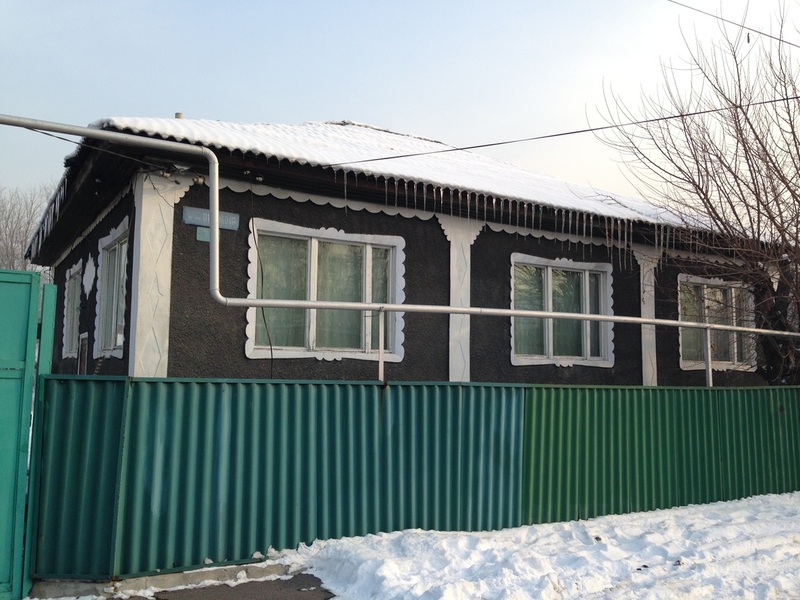 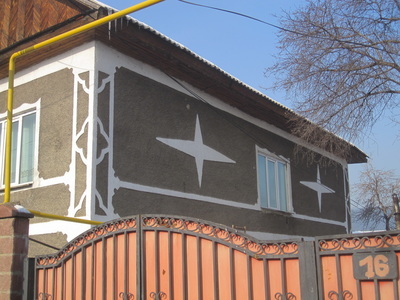 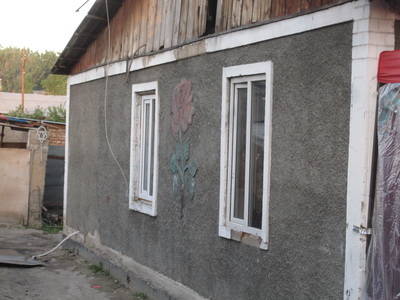 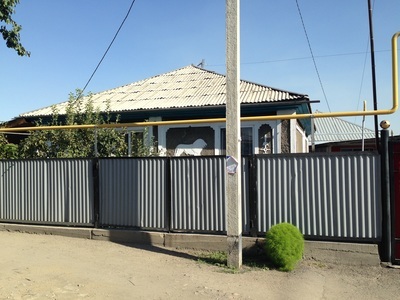 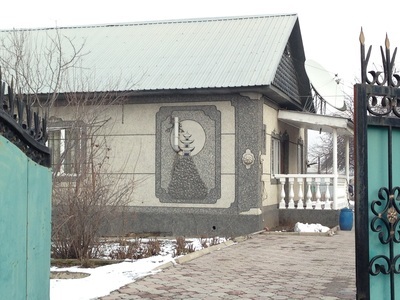 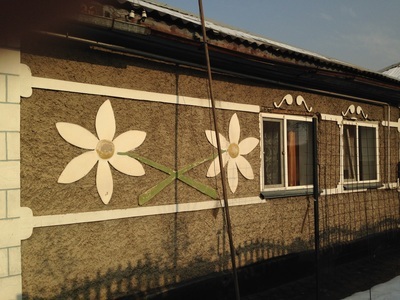 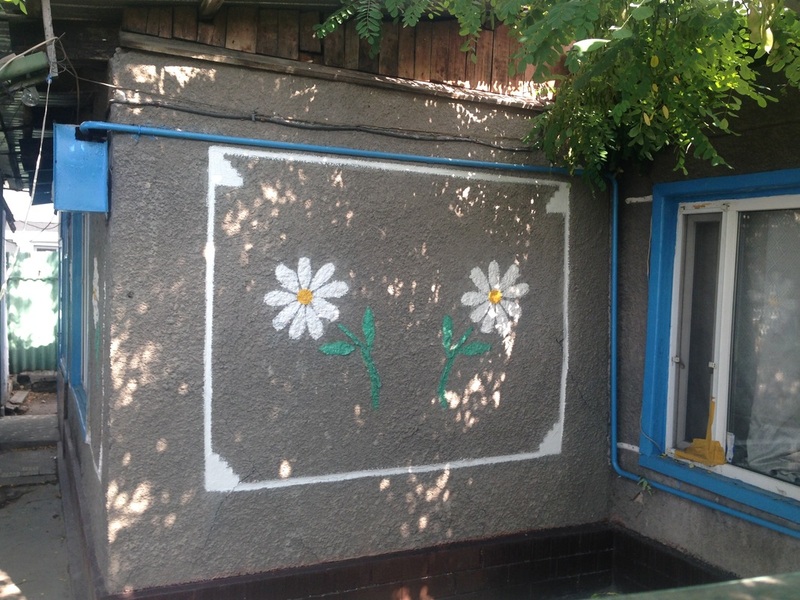 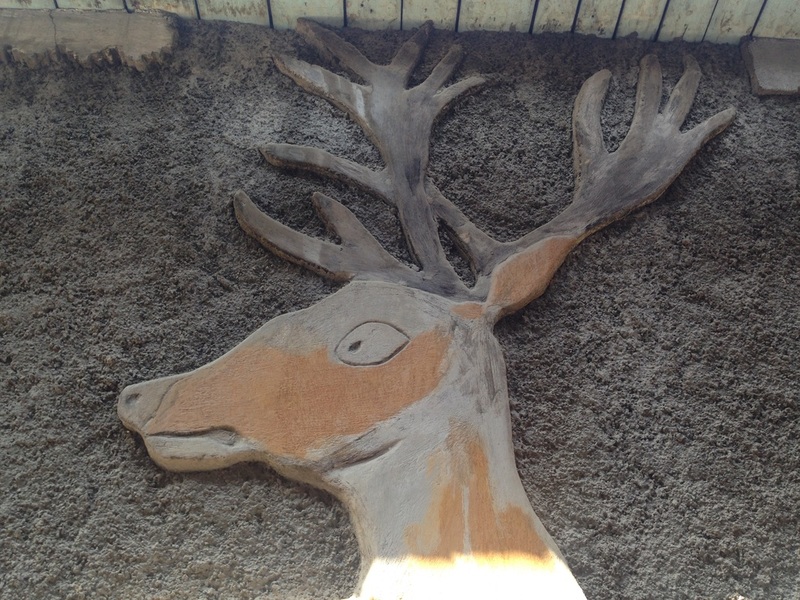 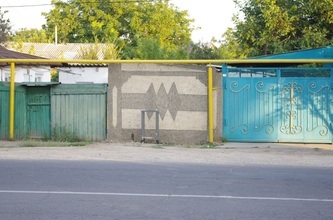 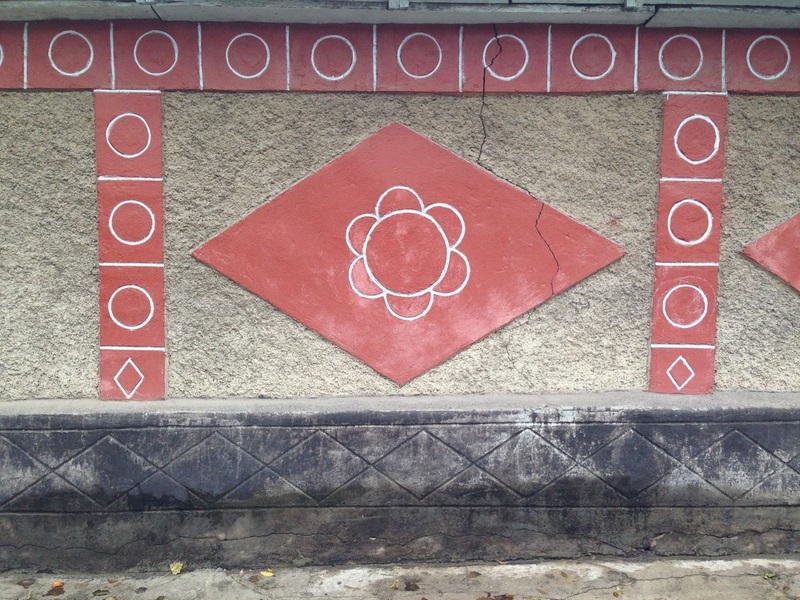 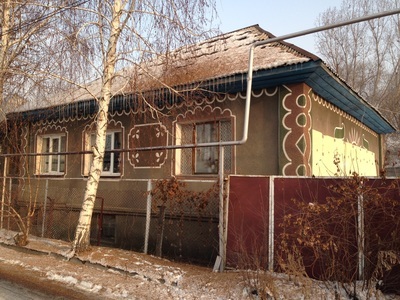 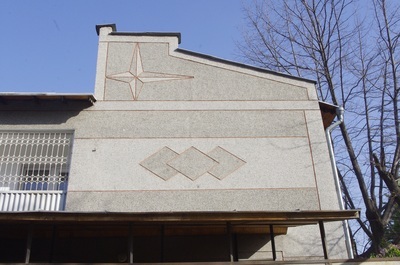 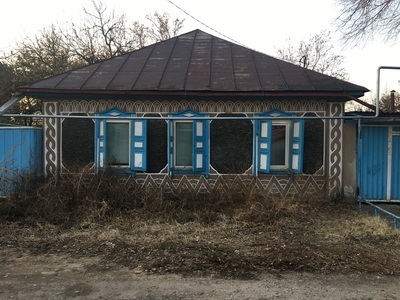 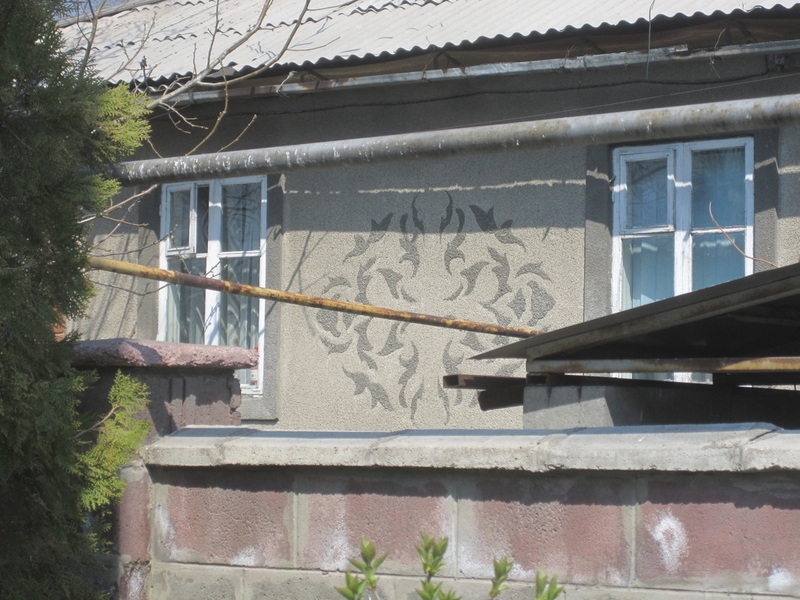 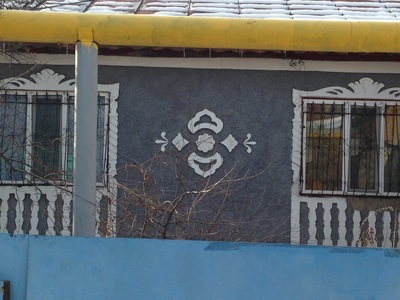 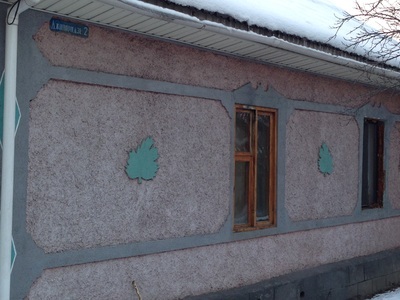 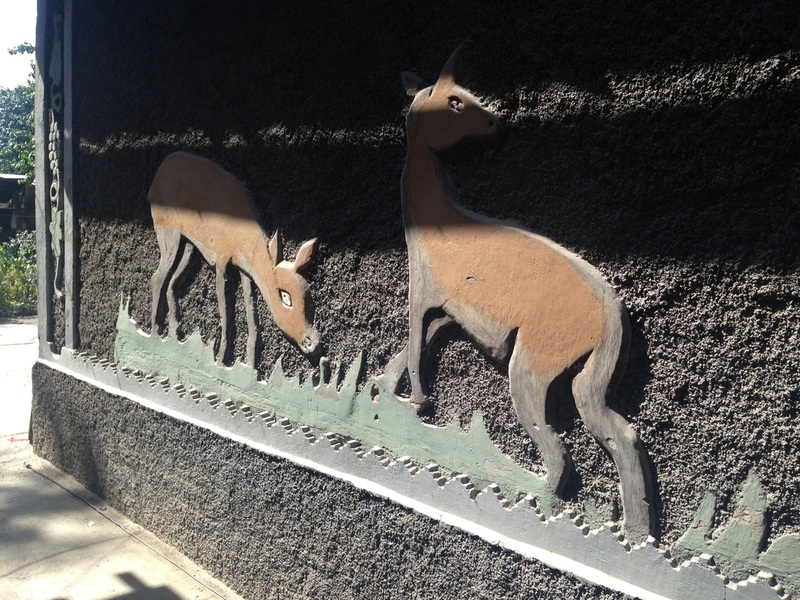 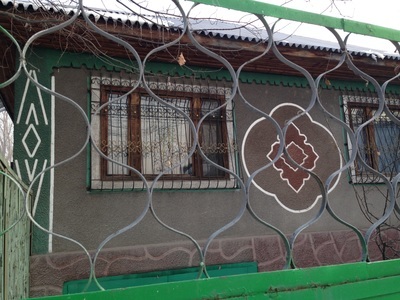 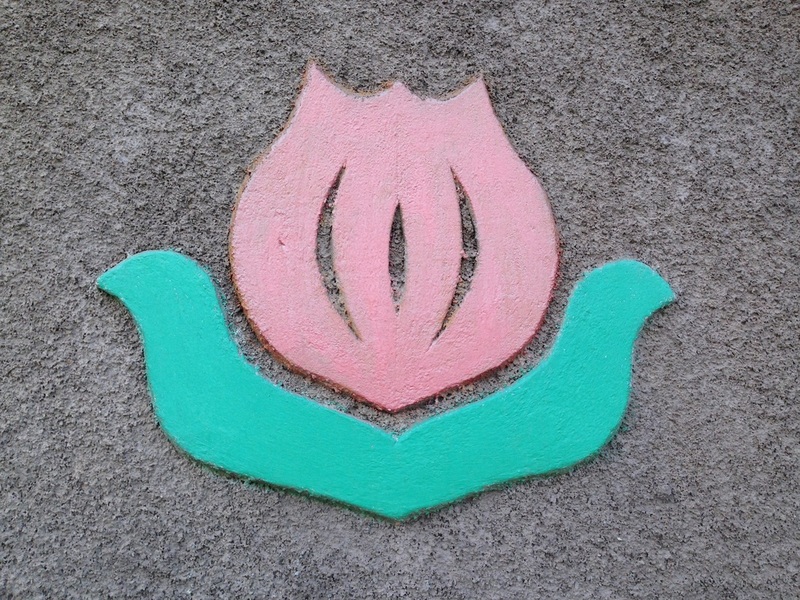 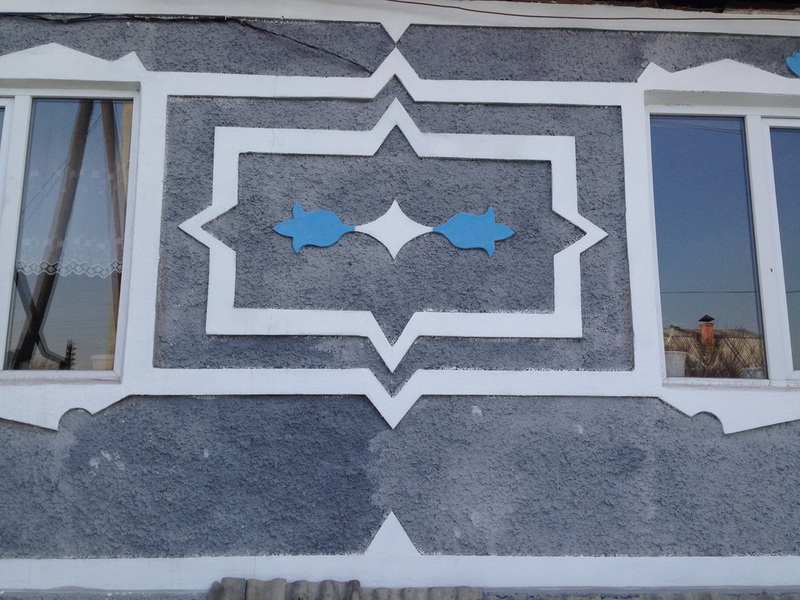 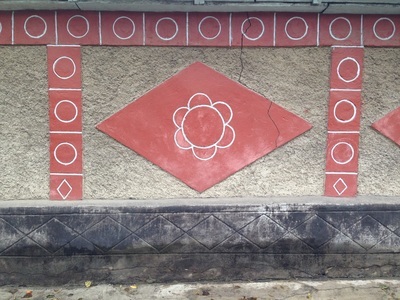 As much interneting as I've done, I've never been unable to find anything about the kind of decoration you see on Almaty homes. 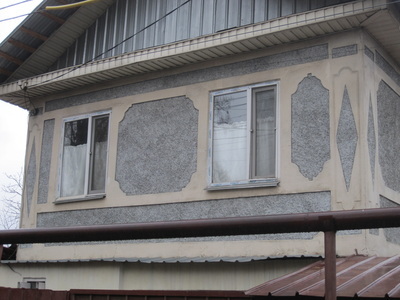 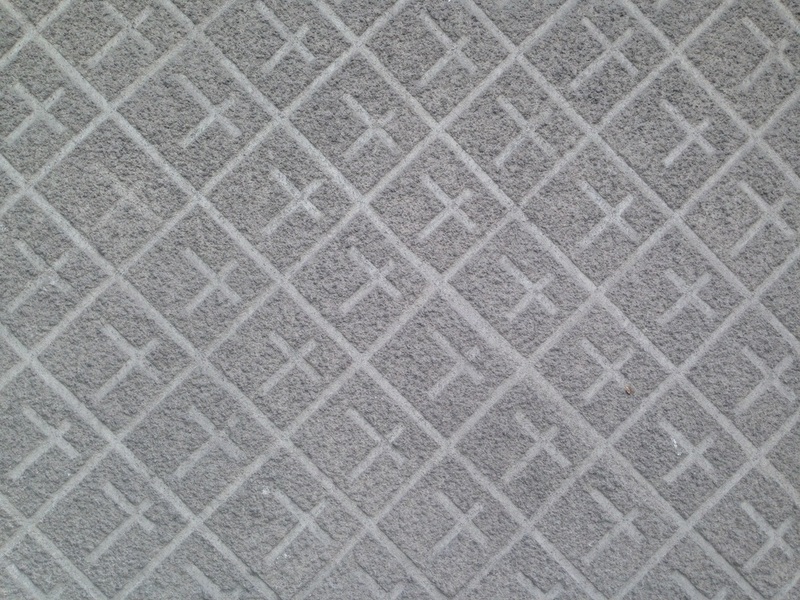 A friend told me that it was especially popular in the 90s, when homeowners called it shuba [шуба], or fur-coat, implying that the material could be used to dress up a dreary house. Another informant, meanwhile, said that in Kazakh they'd call it oyu [ою], which just means ornament. 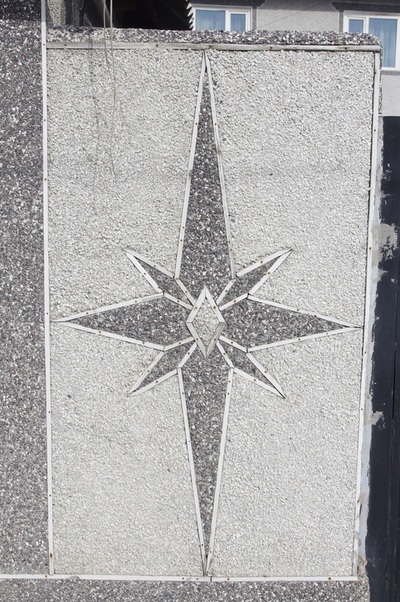 Both terms were research dead-ends. It's possible I'm lumping different phenomena and material together here: some of these facades clearly have the cave-like texture of stucco, while others are smooth and neat; some have little wood slats or rubber strips separating the different materials and colors, while the rest blend textures together without dividers. 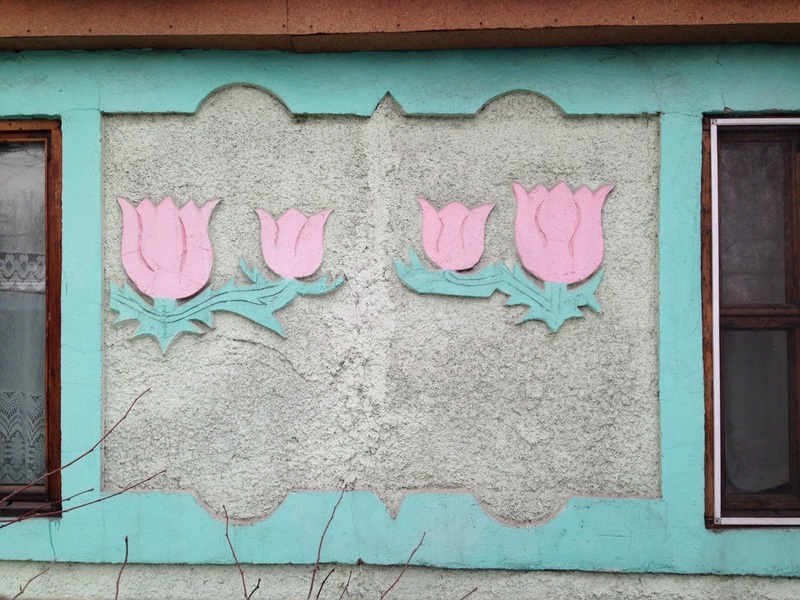 For now, this world of decorative art remains a fun mystery, one I'm eager to keep pursuing. 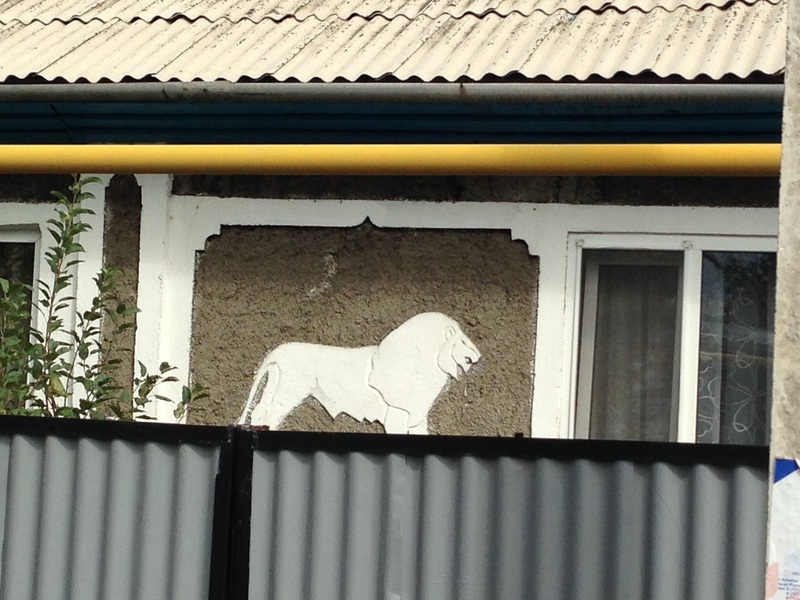 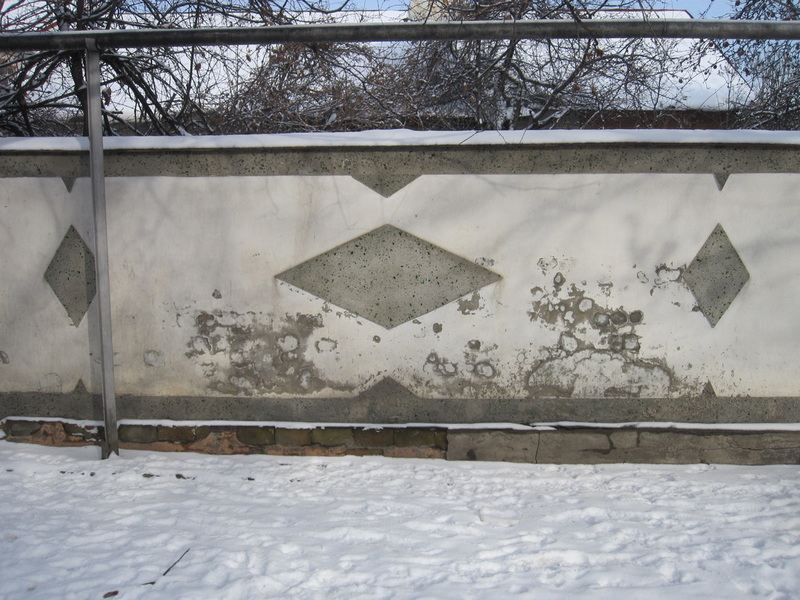 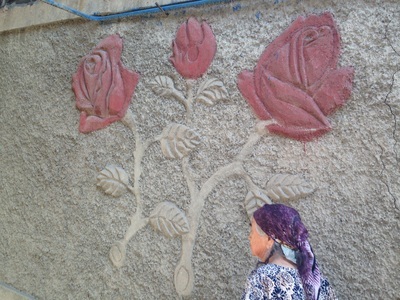 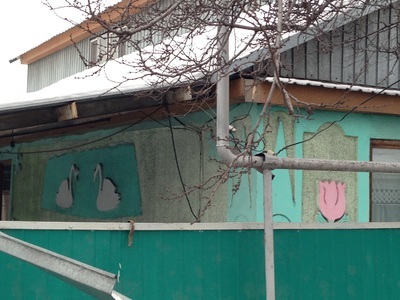 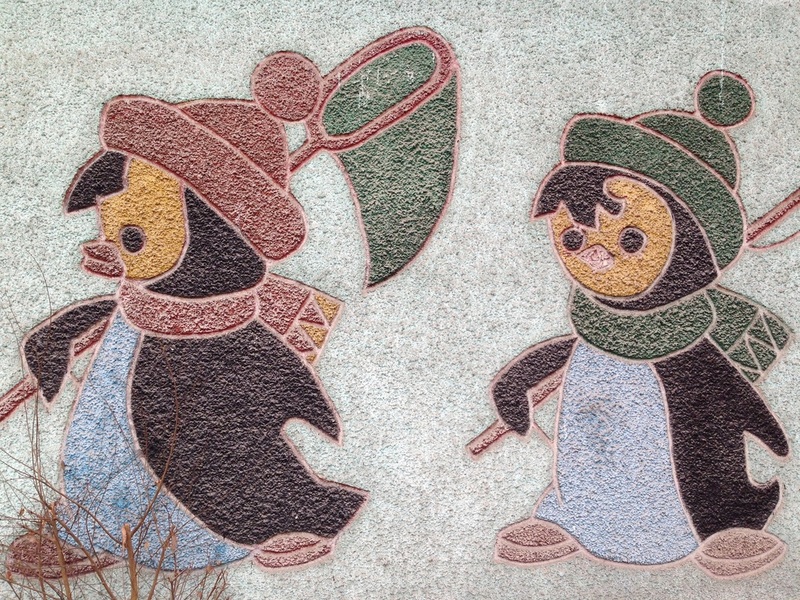 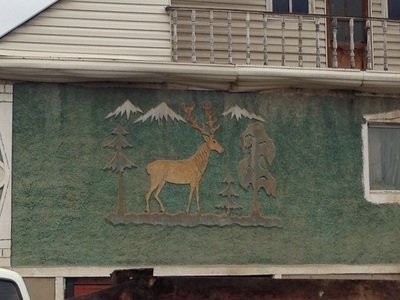 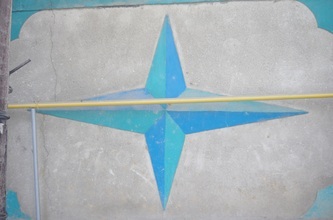 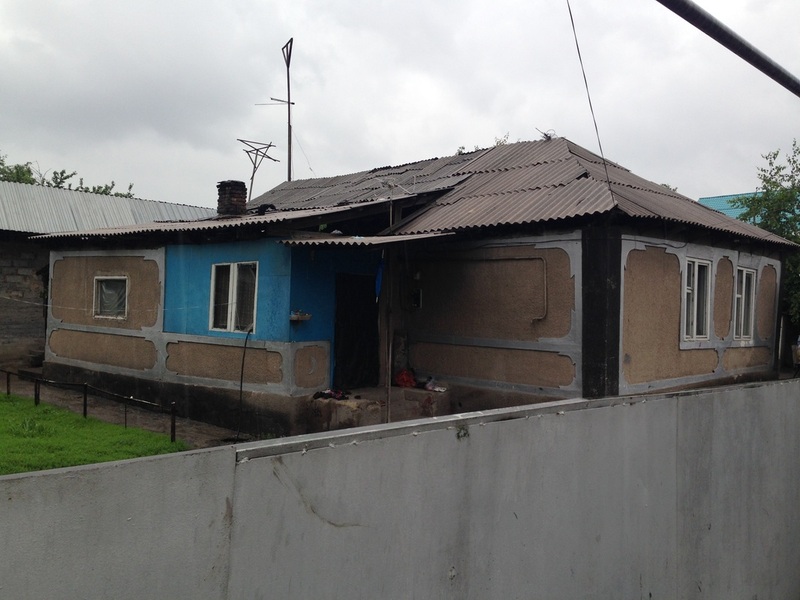 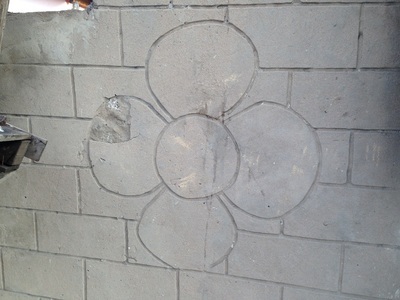 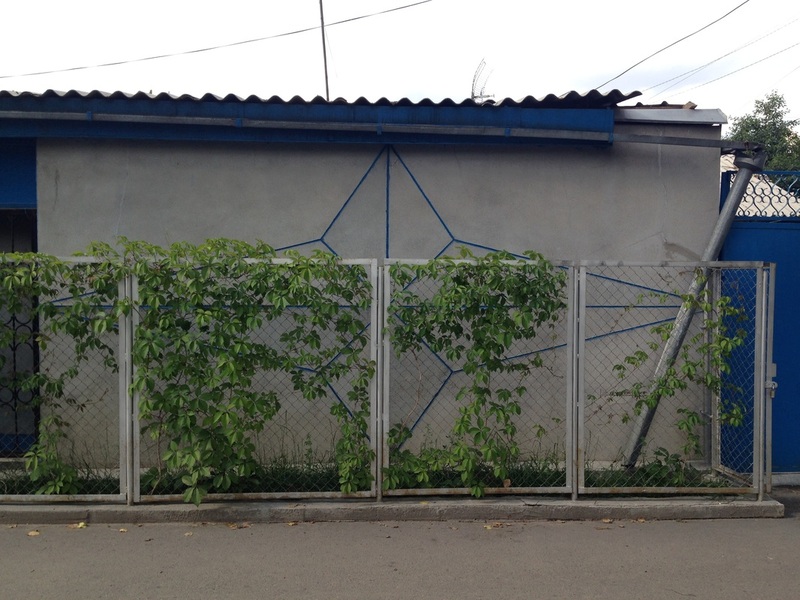 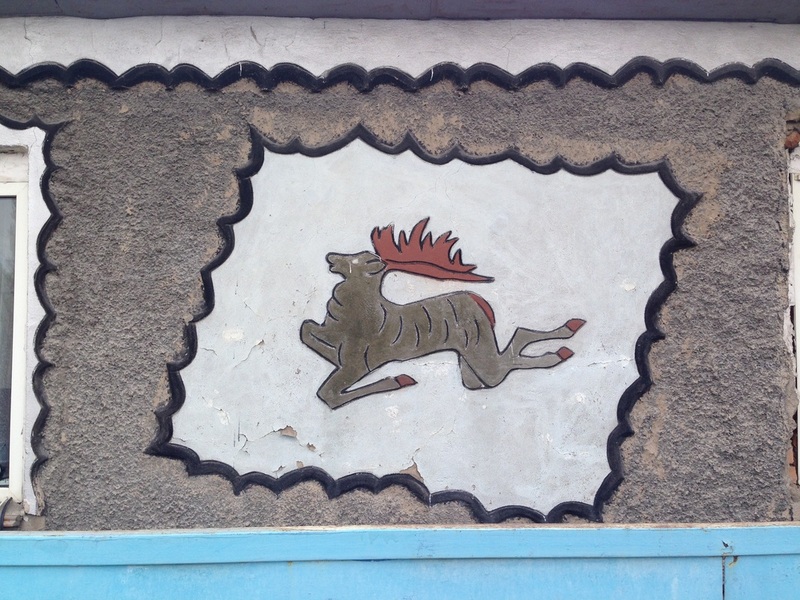 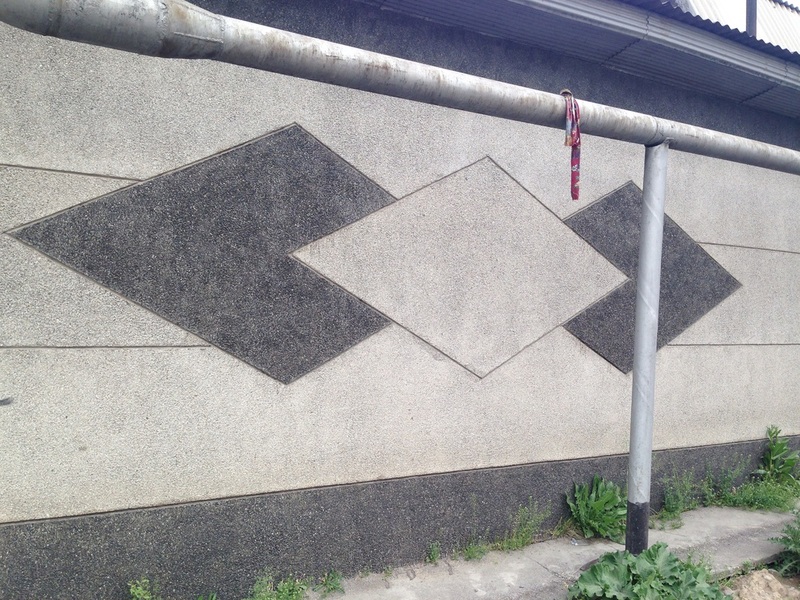 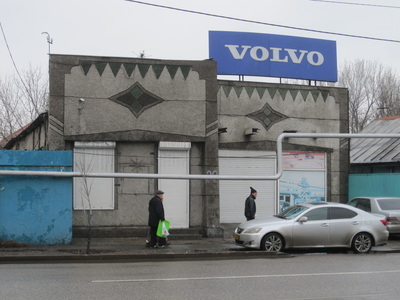 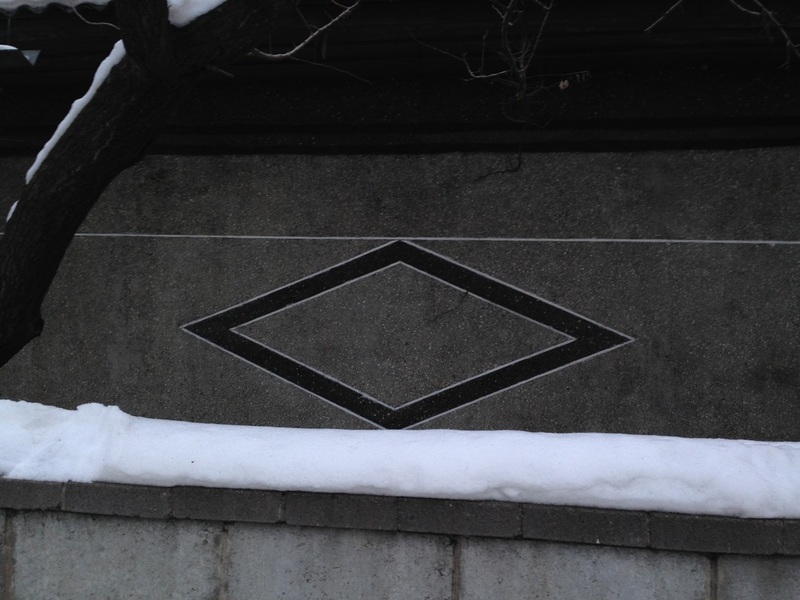 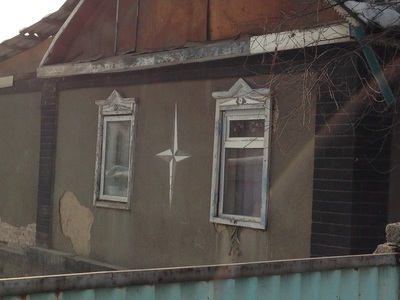 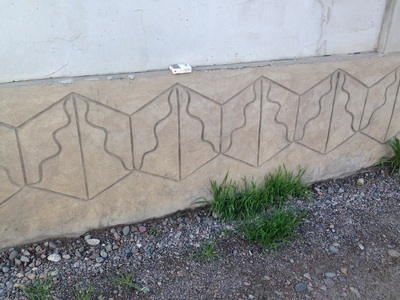 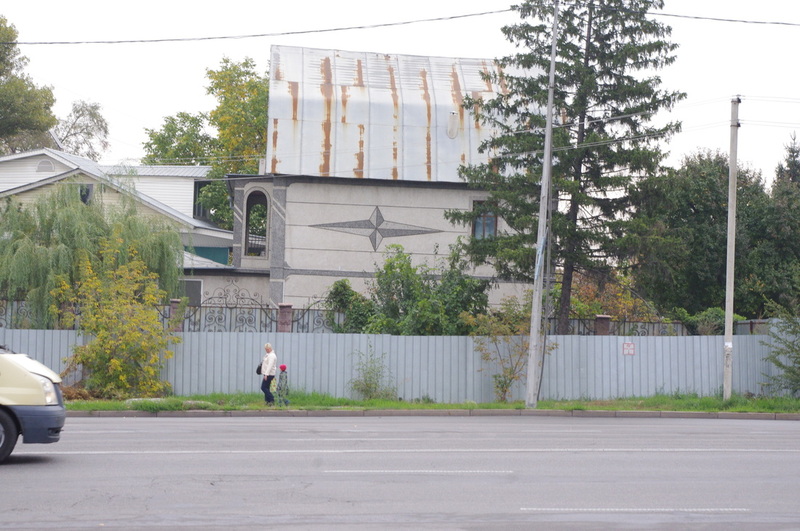 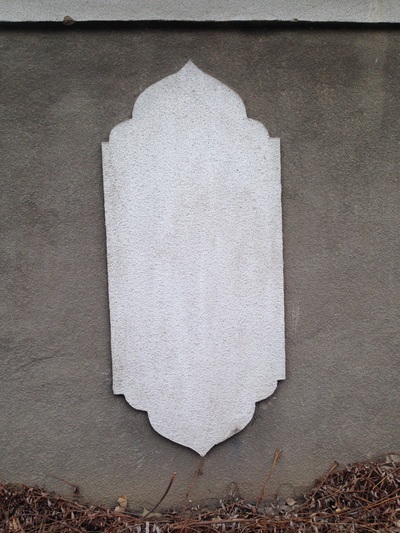 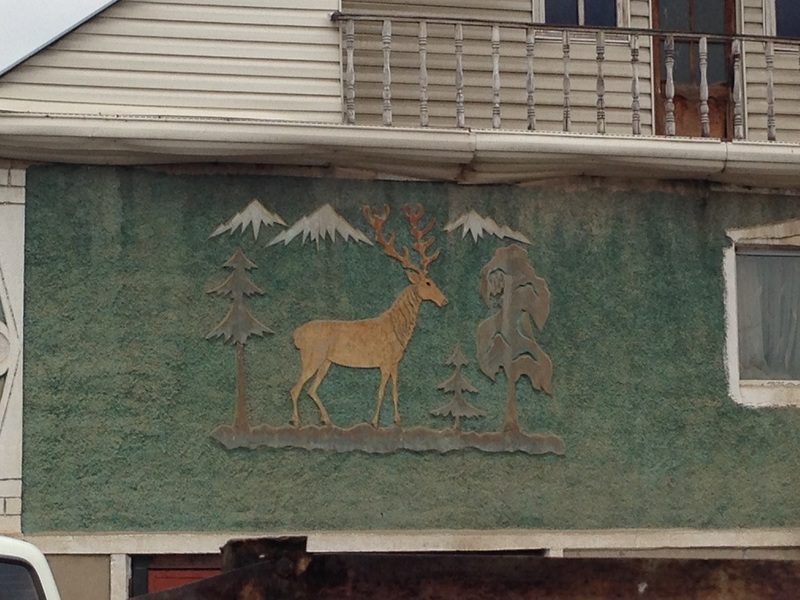 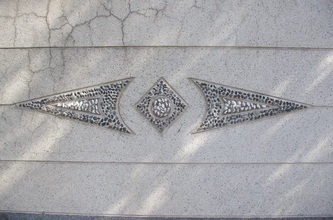 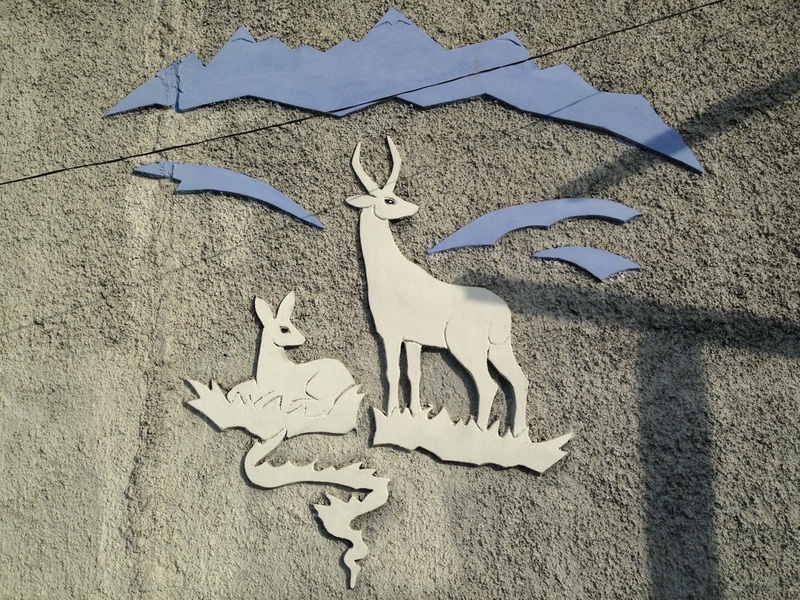 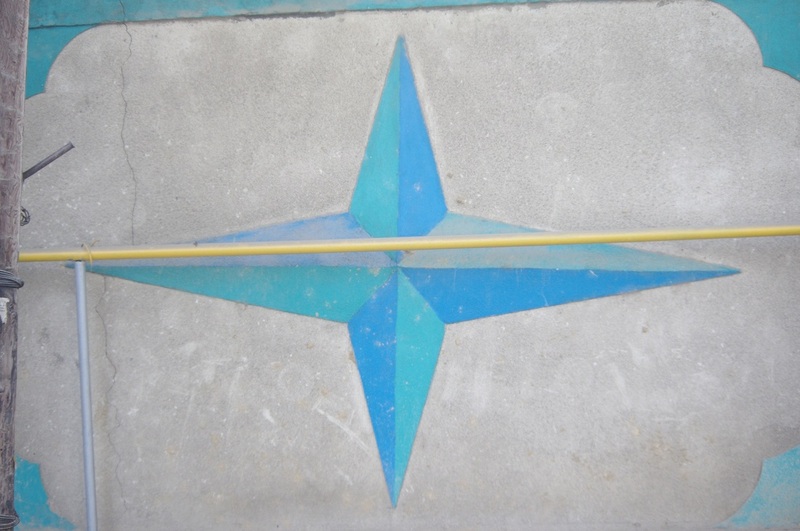 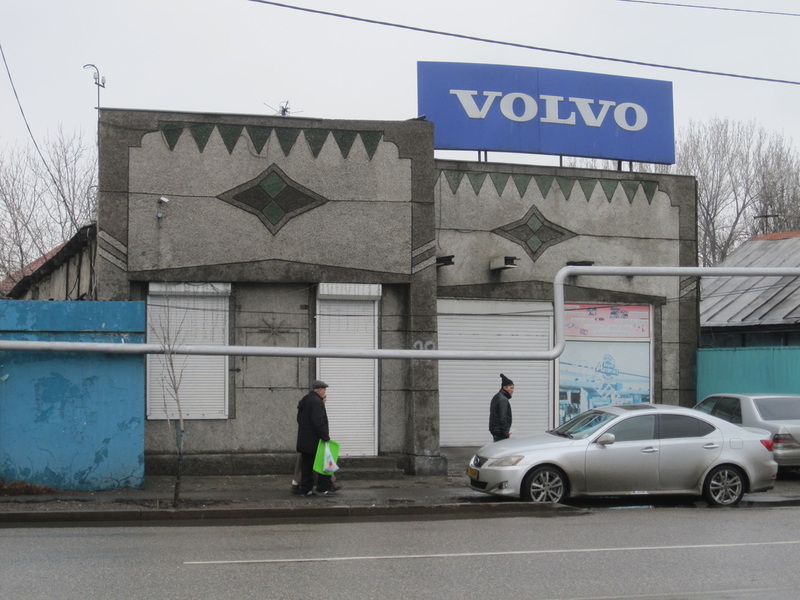 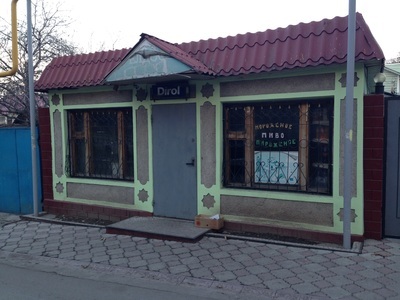 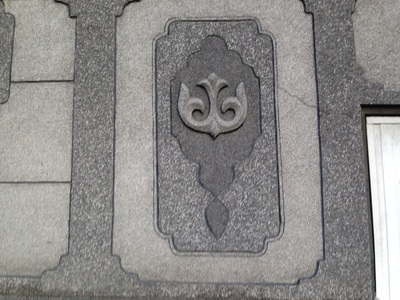 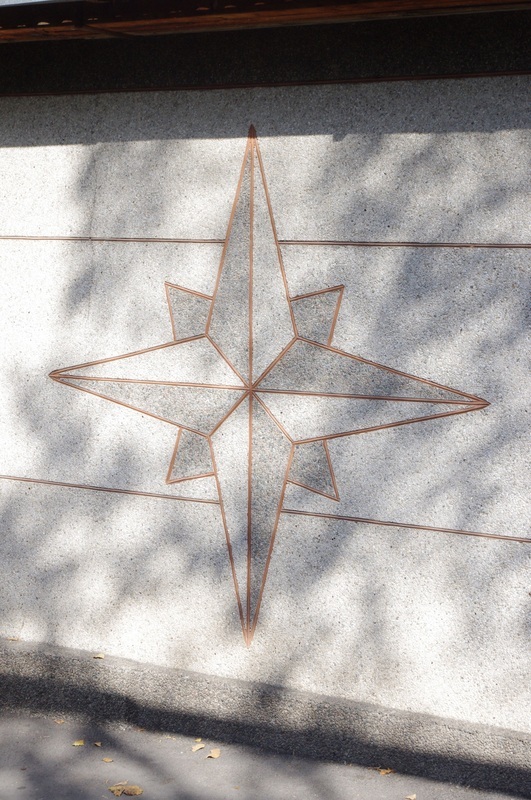 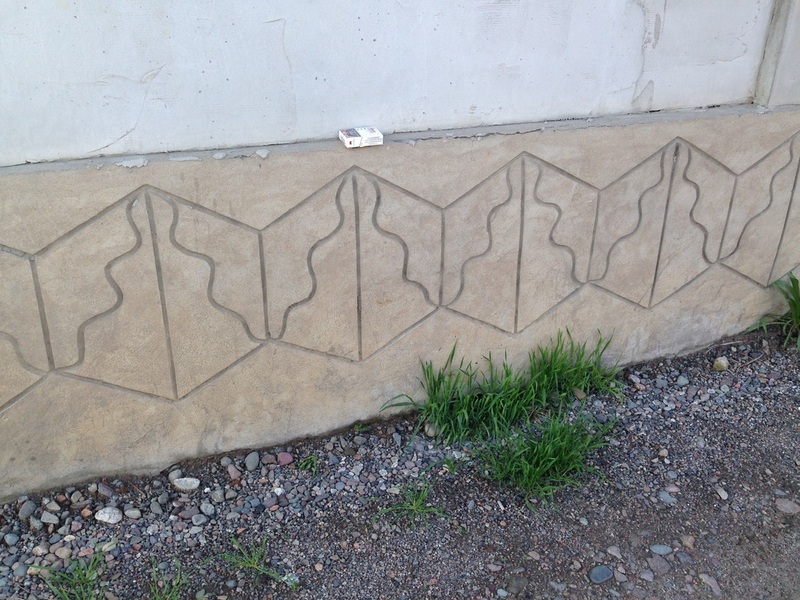 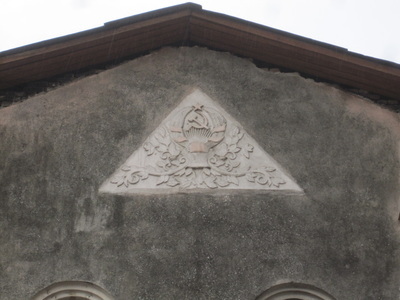 Incidentally, I discovered a clue to one of Almaty's facade mysteries through my winter travels in Vietnam. 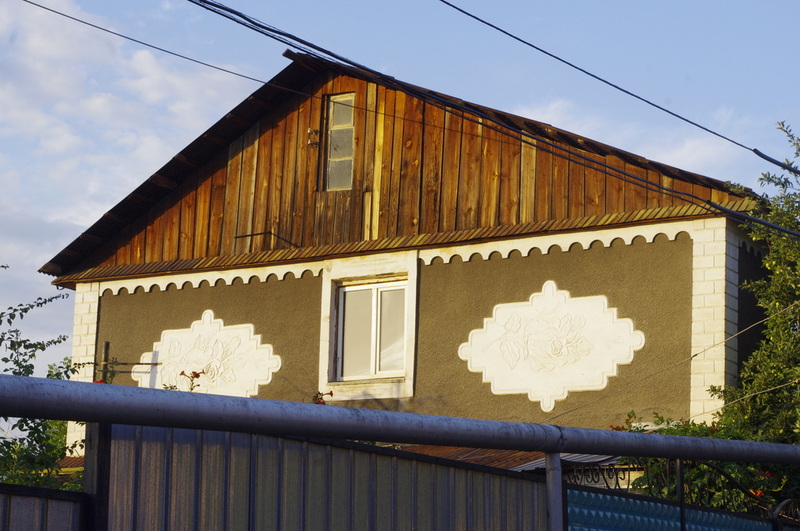 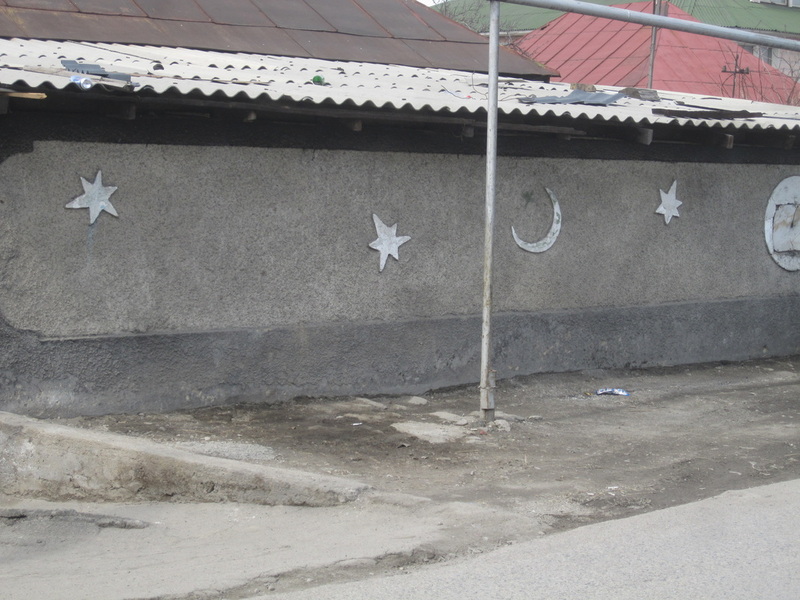 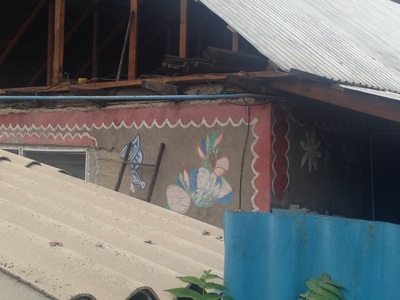 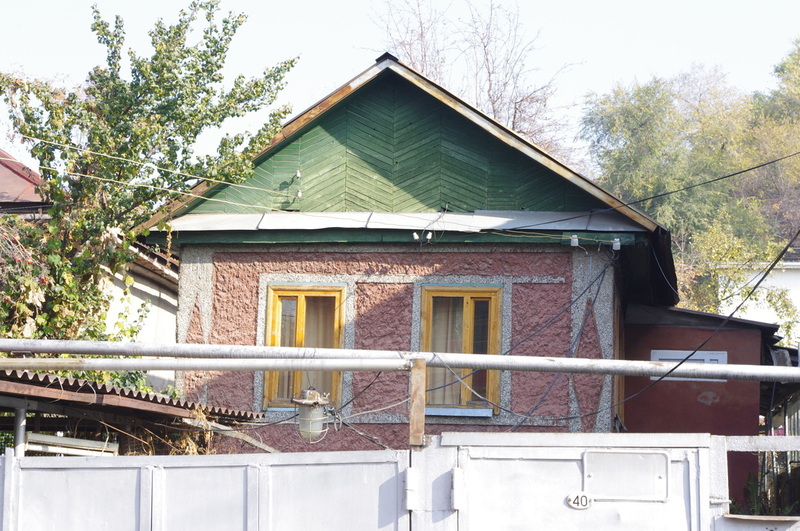 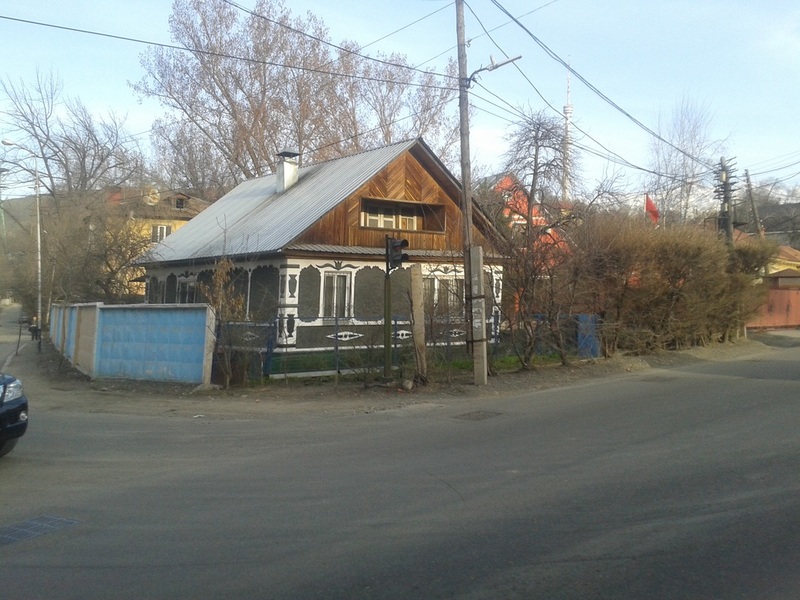 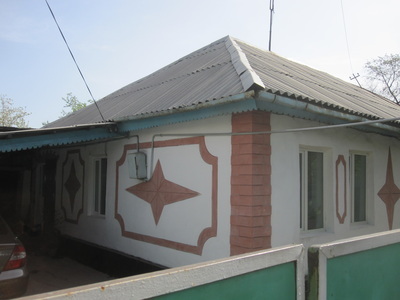 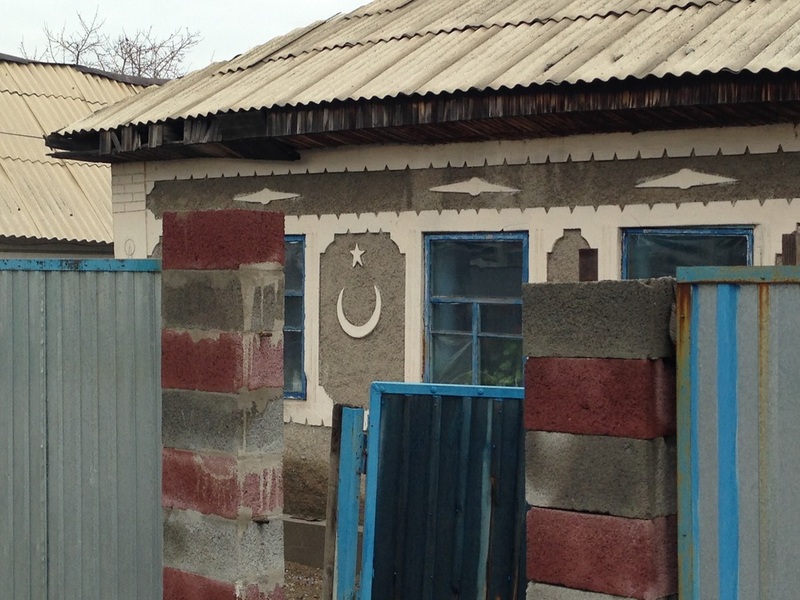 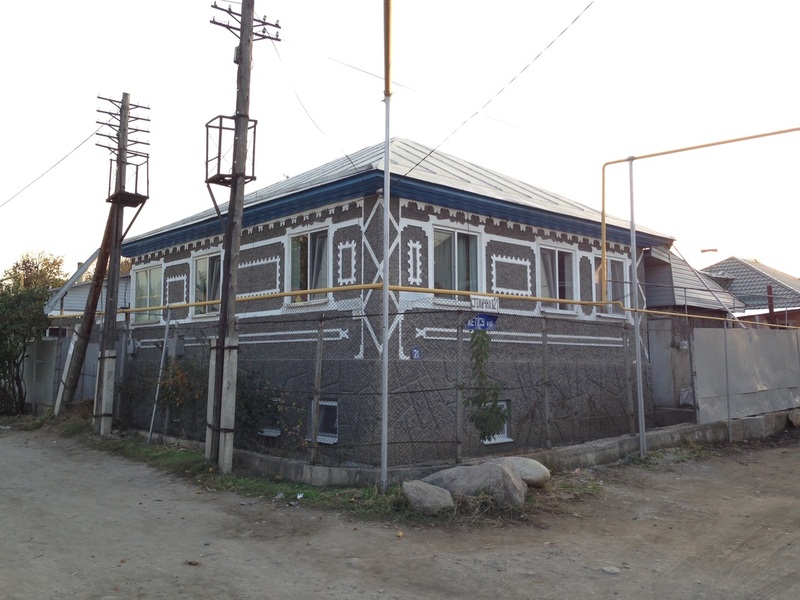 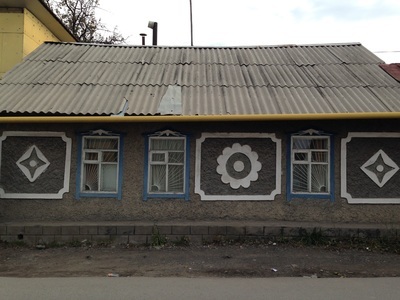 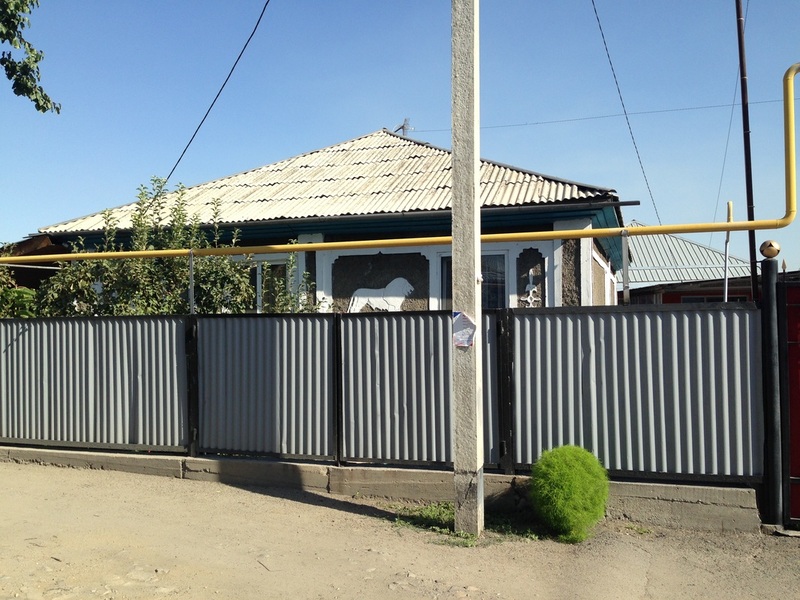 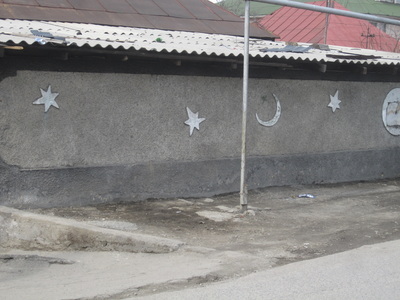 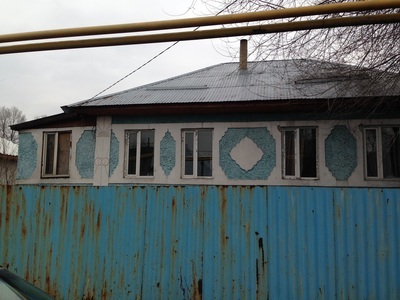 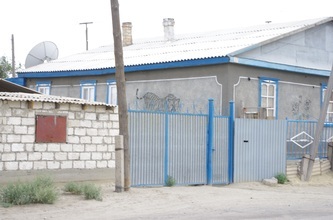 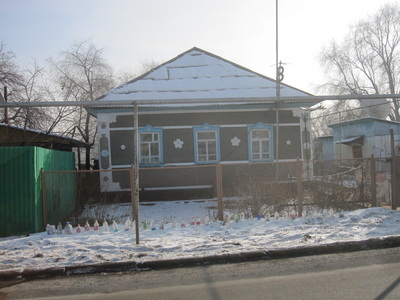 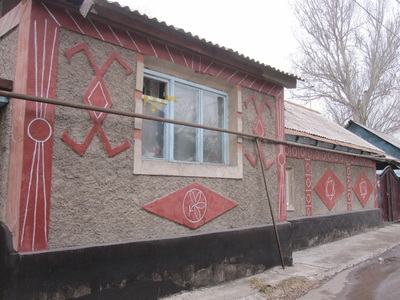 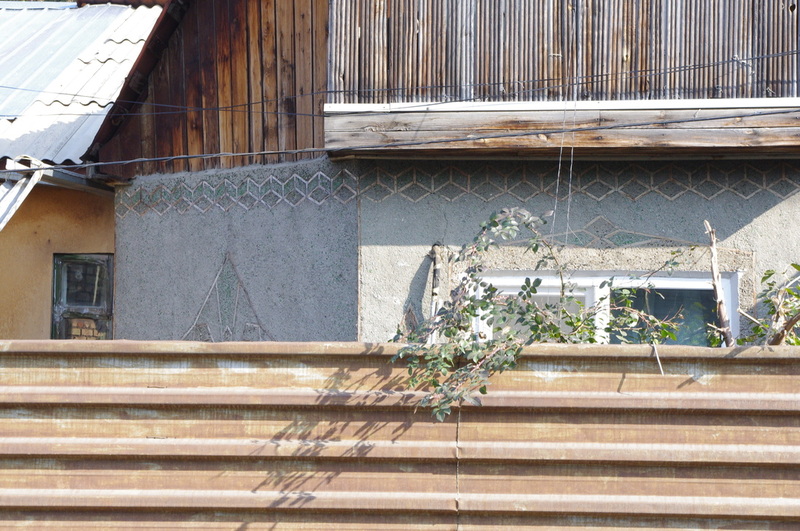 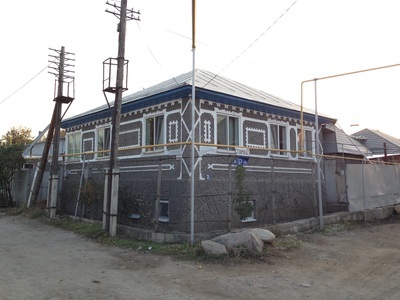 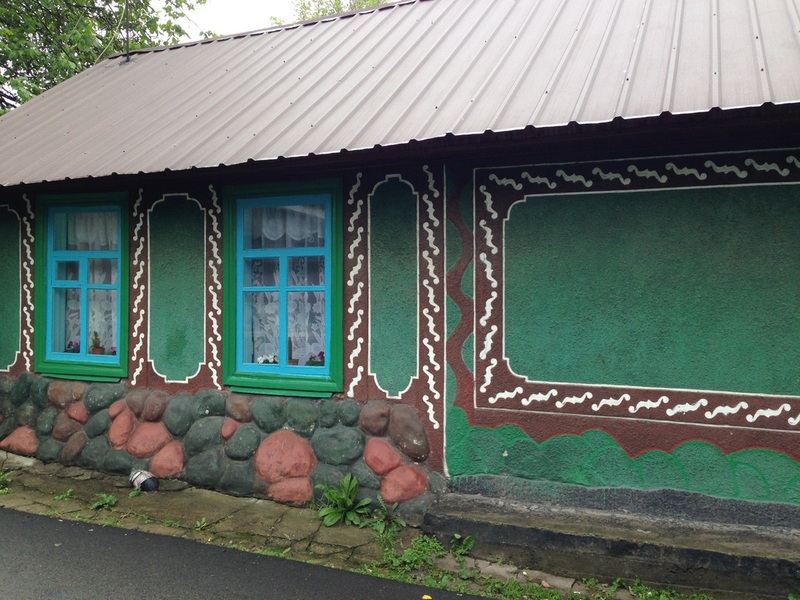 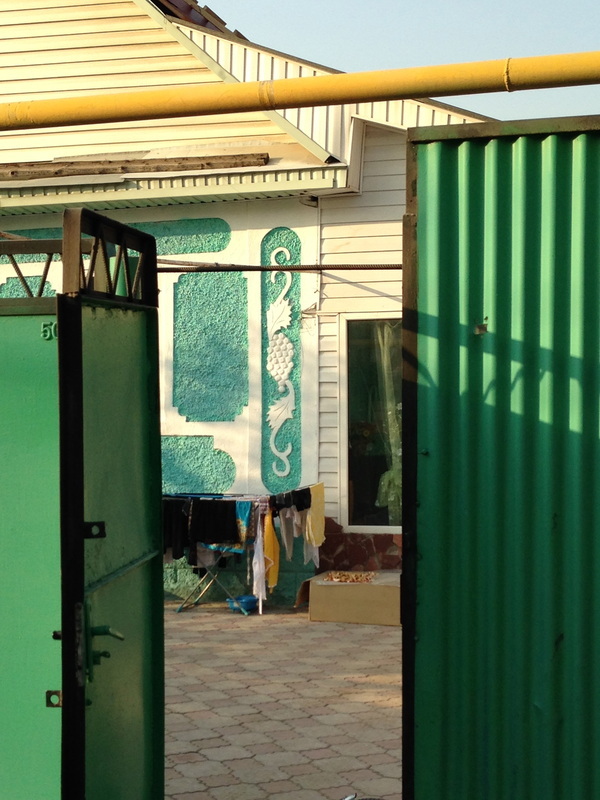 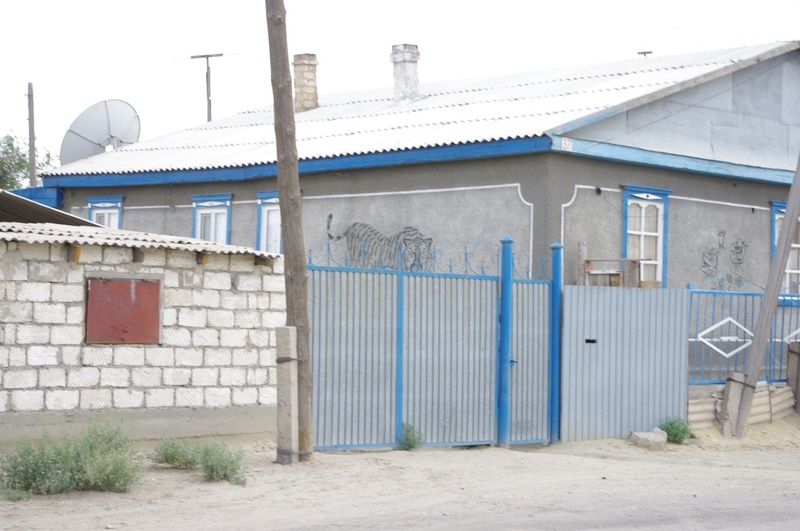 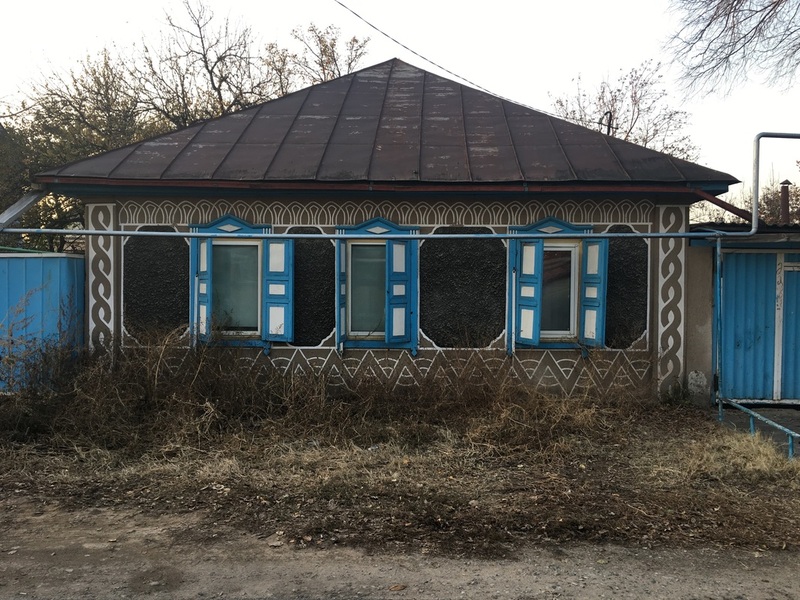 Walking through some fishing villages, I noticed that some of the houses had some of the same rough-textured, polychrome ornamental facades that I'd seen in Almaty. 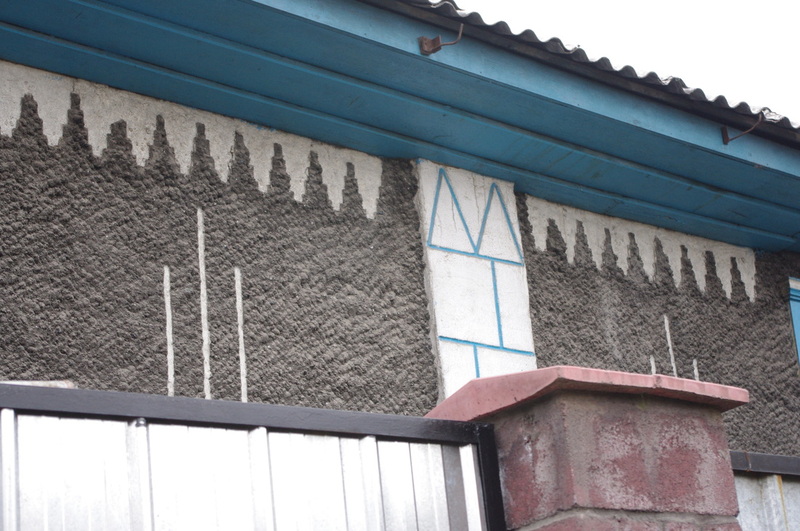 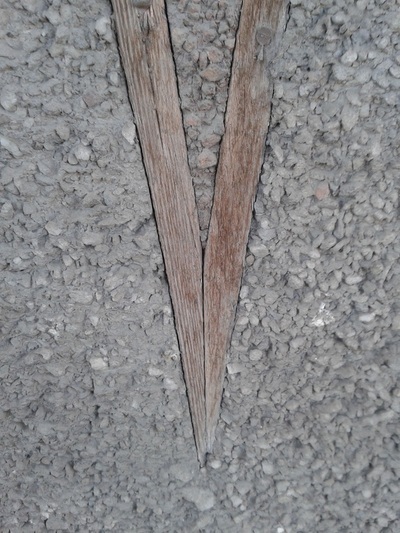 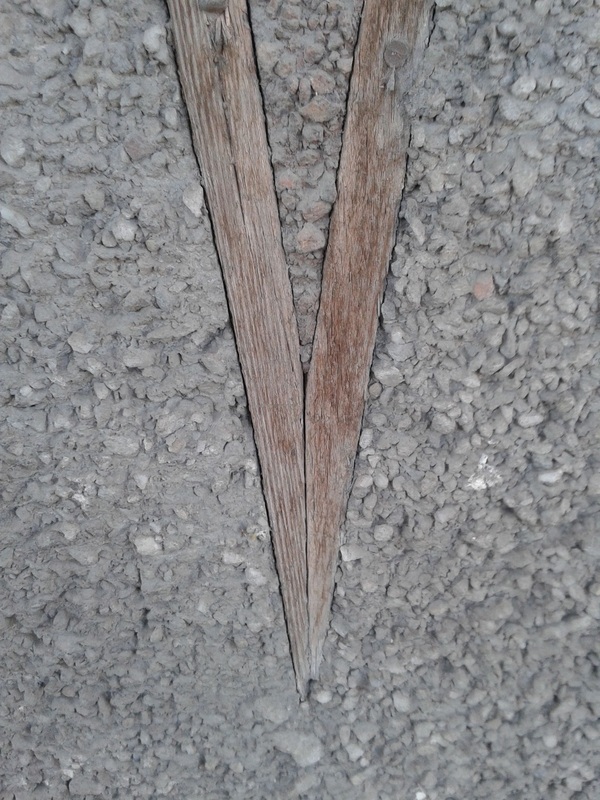 Then, I read in a great blog about Vietnamese architecture that architects call these surfaces "exposed aggregate", and lo and behold, that was the key! 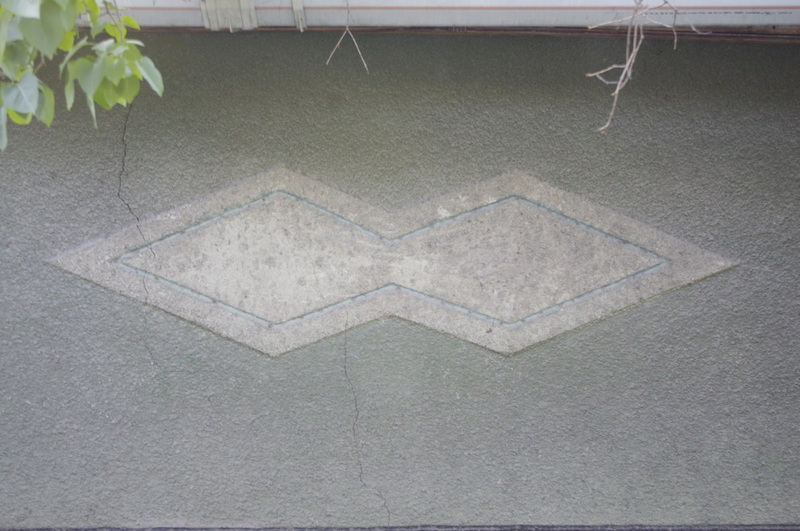 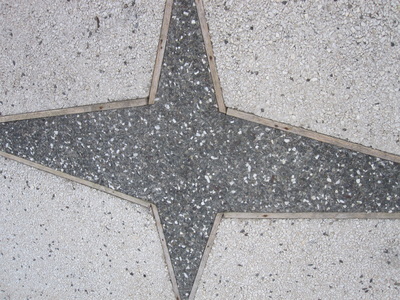 Basically, concrete is made from a mixture of water, cement, and aggregate, which can be something like sand or pebbles or something like shards of recycled glass. 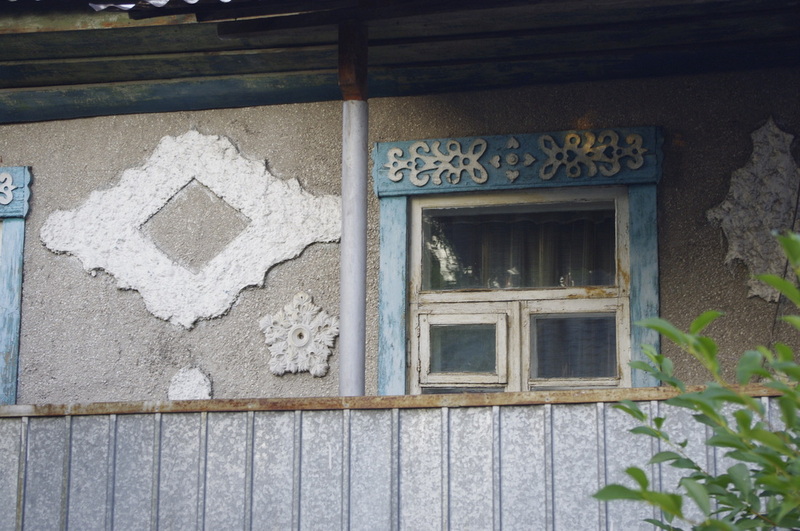 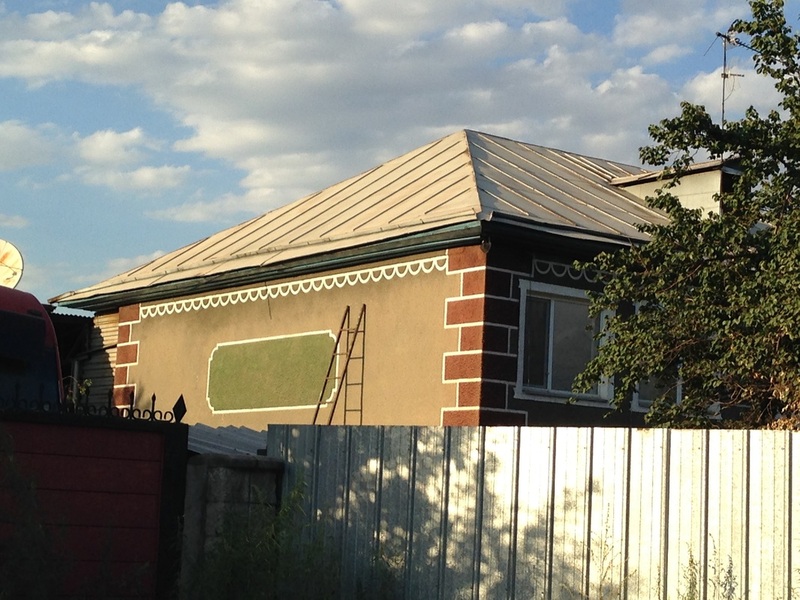 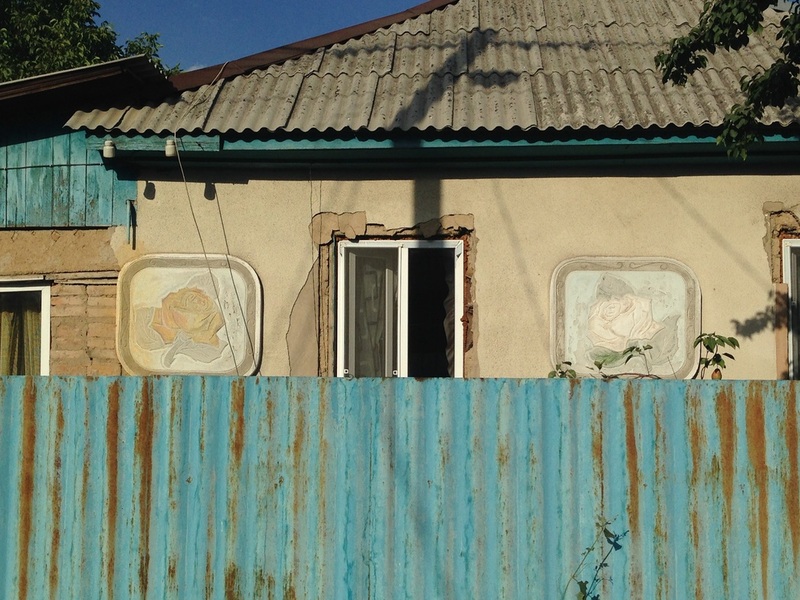 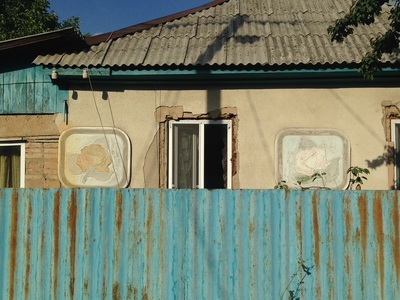 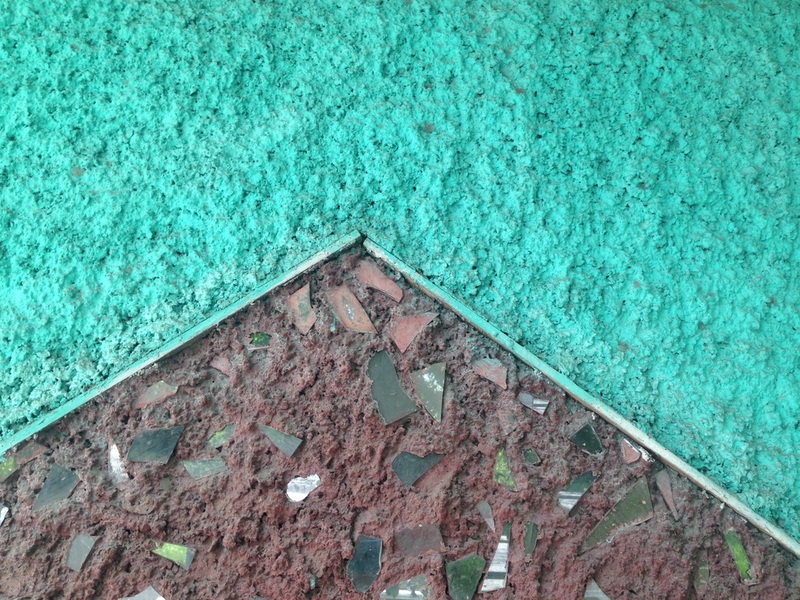 This crumbled glass is called "glass cullet", or in stekloboi [стеклобой] in Russian, and it's behind the distinctive appearance of many Almaty homes. Take a close look at their facades and you'll see glistening green crystals. 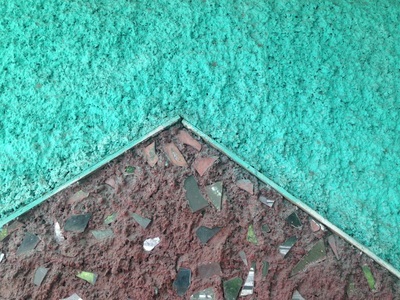 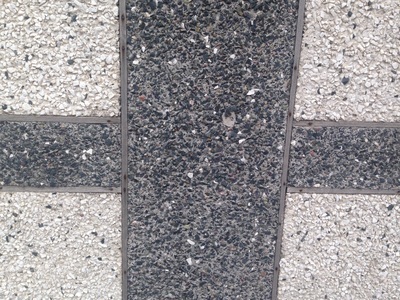 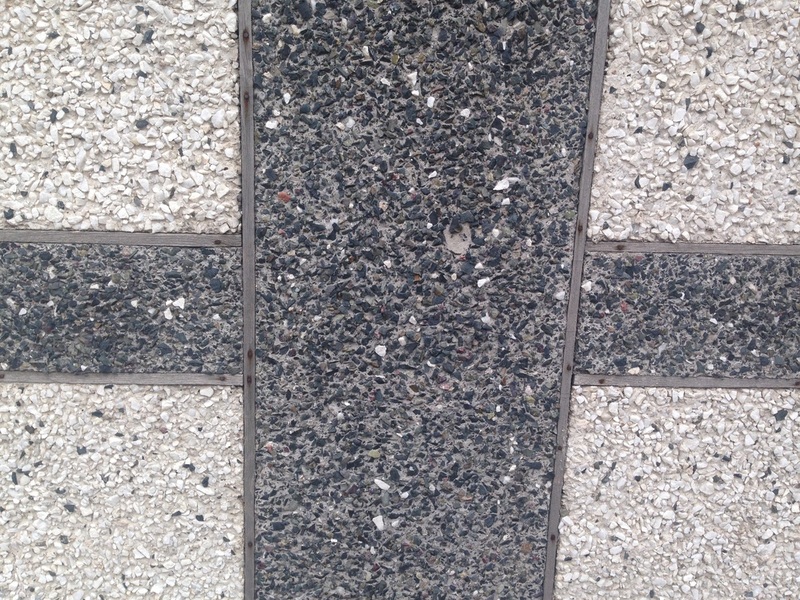 That's cullet, that's exposed aggregate! 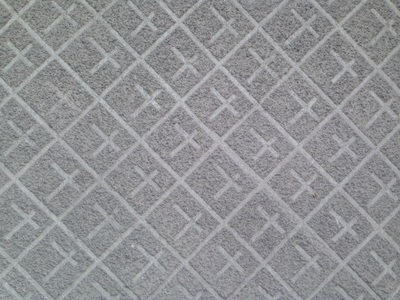 New words are fun, huh?